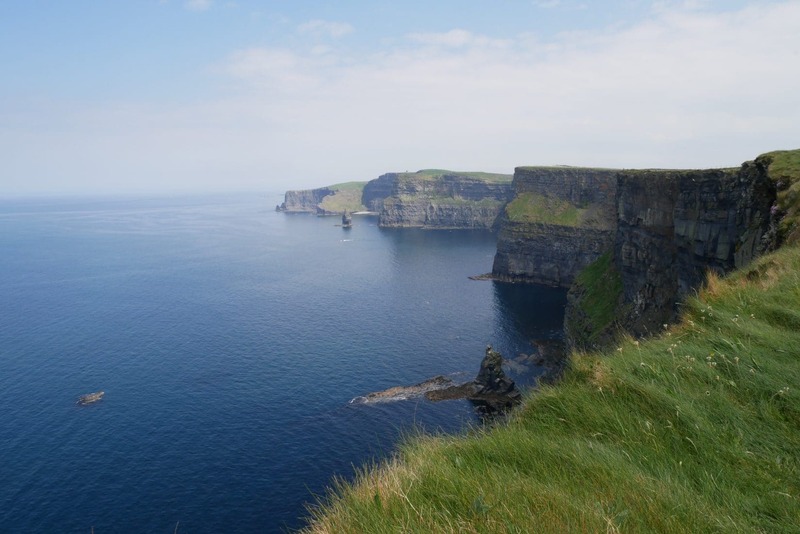 The Wild Atlantic Way is 2500km of road along the wild west coast of Ireland. 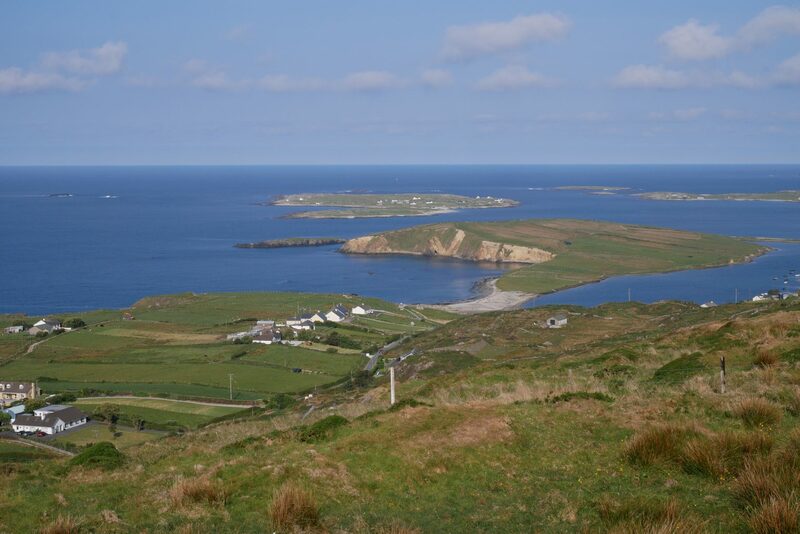 This road extends from Kinsale in the south to Malin Head in the north. 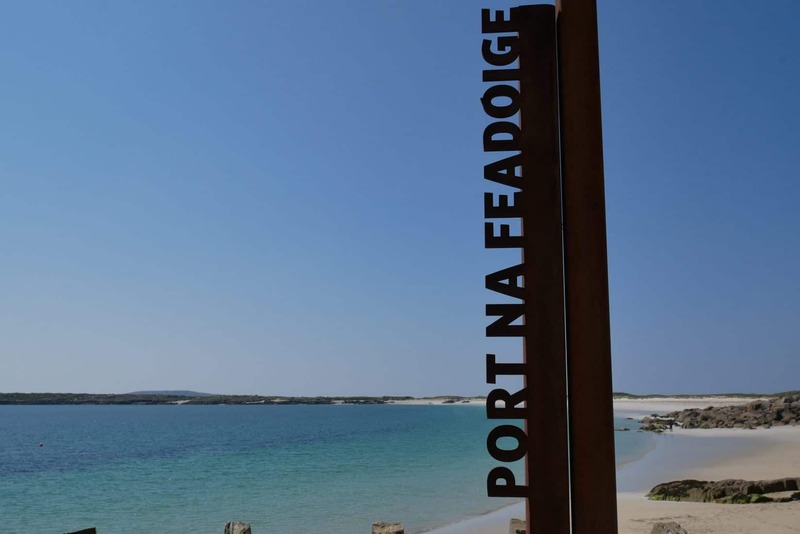 It allows one to discover many Irish counties and many hidden gems to which the Wild Atlantic Way leads us by following its well-founded logo. 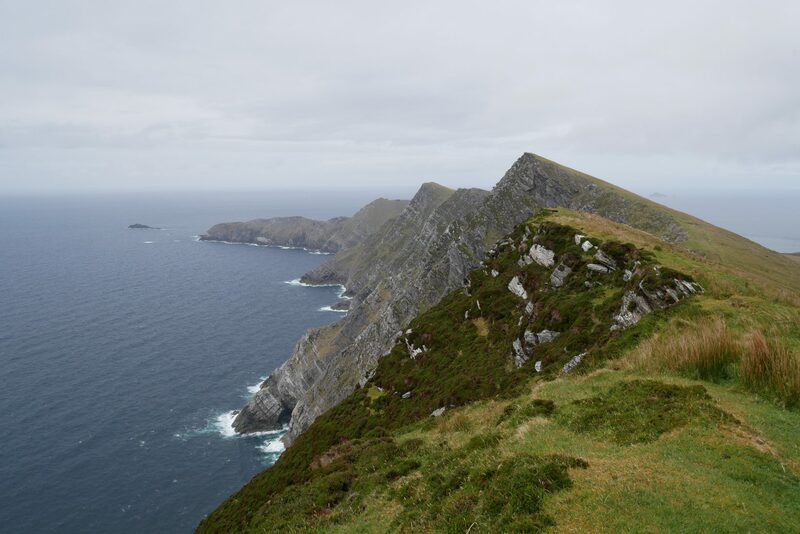 I had only a short week of vacation, so it was impossible to do the entire Wild Atlantic Way. 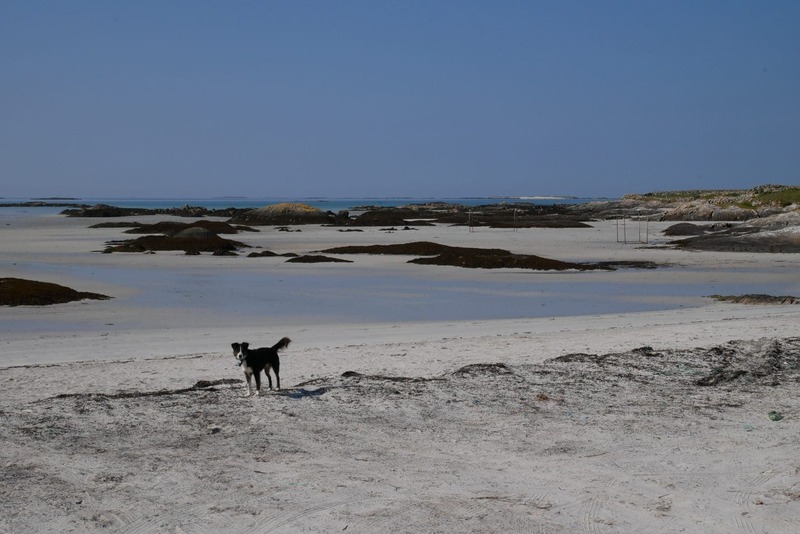 So I decided to limit my wanderings between Limerick and more precisely Loop Head and Sligo by taking my time in Connemara that I wanted to discover especially. Departure 09 March at 13h from Charles de Gaulle with Aer Lingus. As I will be in the car I am not travelling especially light, so I leave well loaded. Check the security deposits required when renting your vehicle. Also, be careful with the insurance supplements that we will try to sell you and that ultimately does not (necessarily) change much. For my part I use a GOLD card (free with most banks today) which allows to have additional insurance in case of damage on the car. Well, after that I get the car, a brand new VW Golf. I’ll be pretty good in there. I take possession of the premises and this is where the difficulties begin: DRIVING LEFT IN IRELAND !! It will therefore be necessary to go directly reality (note the number of times that this “detail” is recalled at the airport, down to the toilet …). I have already driven to the left but in a French car, there I will have to manage the direction of traffic and the shift of gears on the left !! I will pass on the crossing of Ireland to Limerick. All I can say is that it is surprisingly fast (2: 30-3: 00). I leave the “big roads” a little after Limerick towards Ennis to join the N68 in direction of Kilkee, small town by the sea. The road already dwarfs and it requires more concentration. 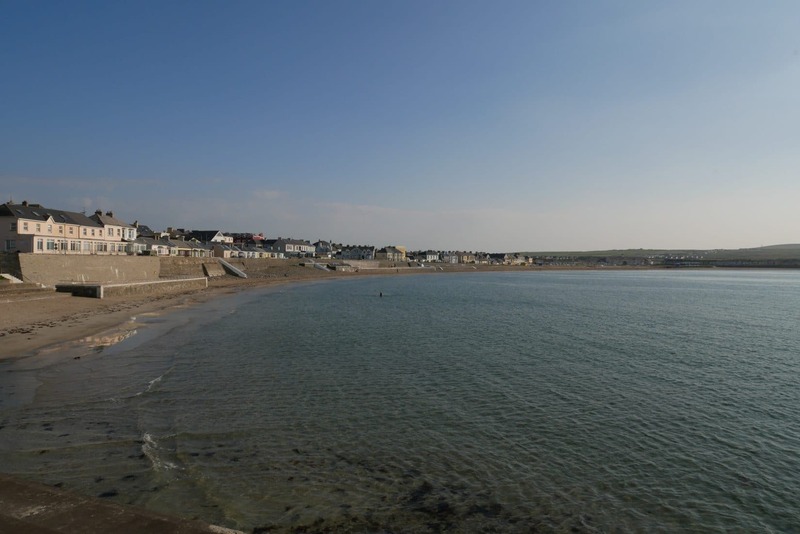 In the end I arrive in Kilkee around 18:30. The city is calm, there are not many people in the streets. The waterfront is nice but not stunning. I stop to take a little air and make my plans for the evening: initially I wanted to sleep in a campsite in the city but it is not at all by the sea and, is above all composed of mobile homes and caravans … not great. 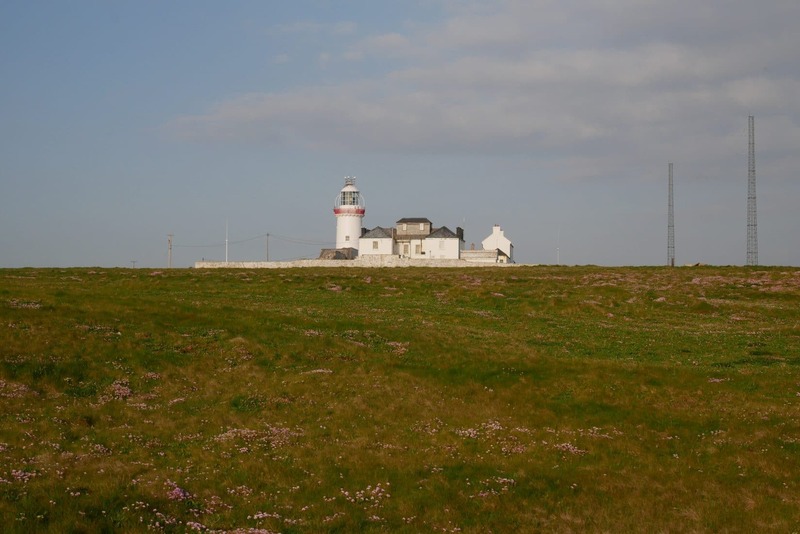 As it is still early I will go to Loop Head and I will improvise on the spot. It is at this moment that I really get the Wild Atlantic Way and that really begins the journey. The roads, out of town, are tiny! Fortunately there are not many people and I can get used to this. 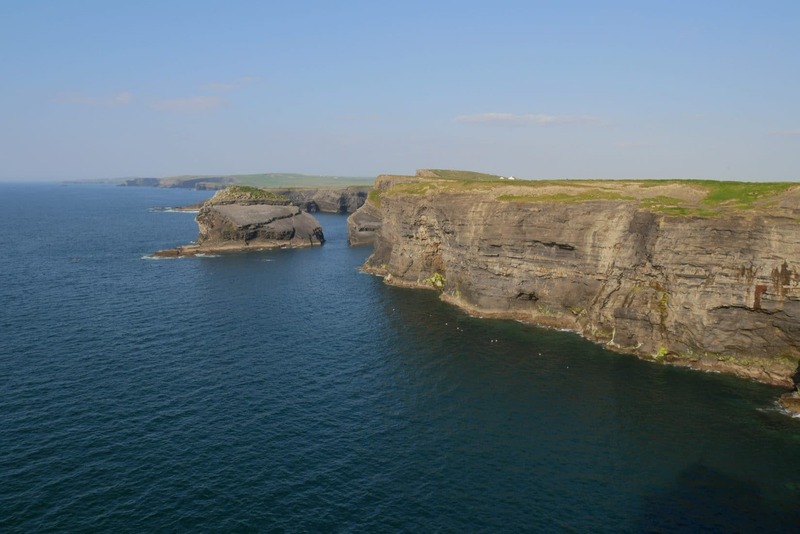 From the exit of Kilkee, one falls on a beautiful line of vertiginous cliffs. I stop already for taking some pictures. 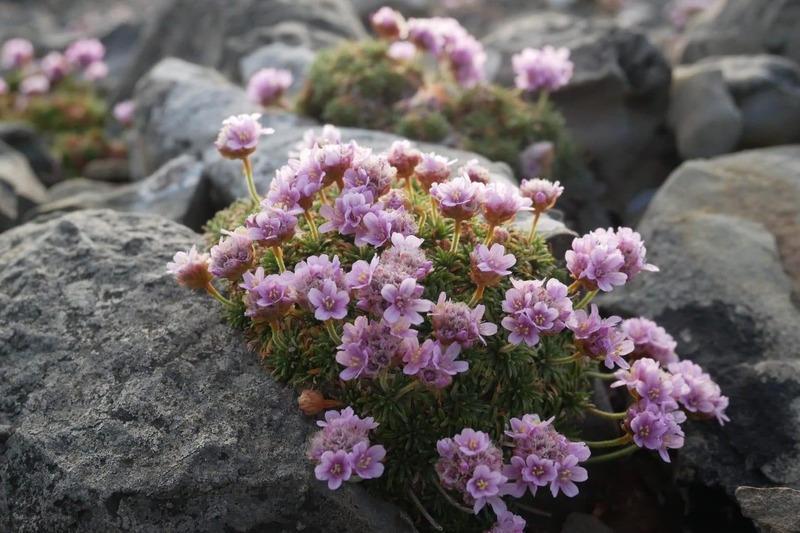 Small parenthesis: I was marked these first days by the smell very special (not bothersome or unpleasant) in these areas of cliff. I’m not sure but I think it’s due to the nesting seabird colonies. 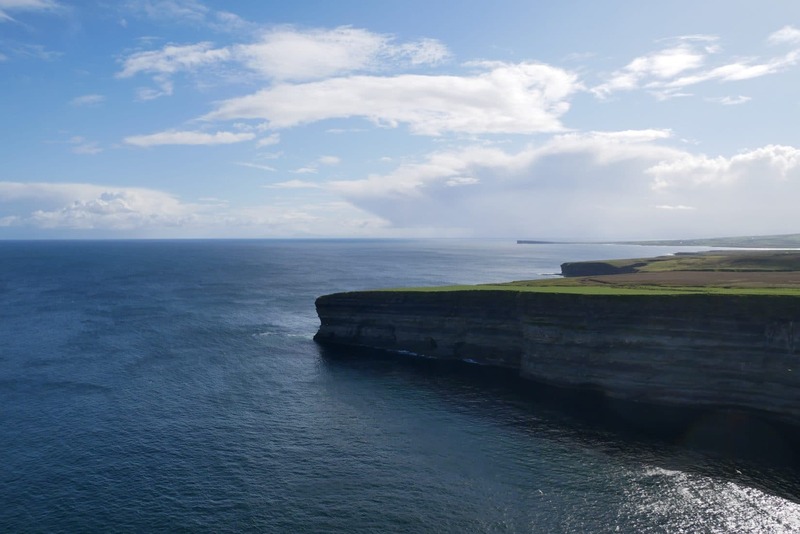 The road leads nicely to Loop Head which is on a head. The landscapes are made up of fields, very green, it is an agricultural region. The weather is nice. 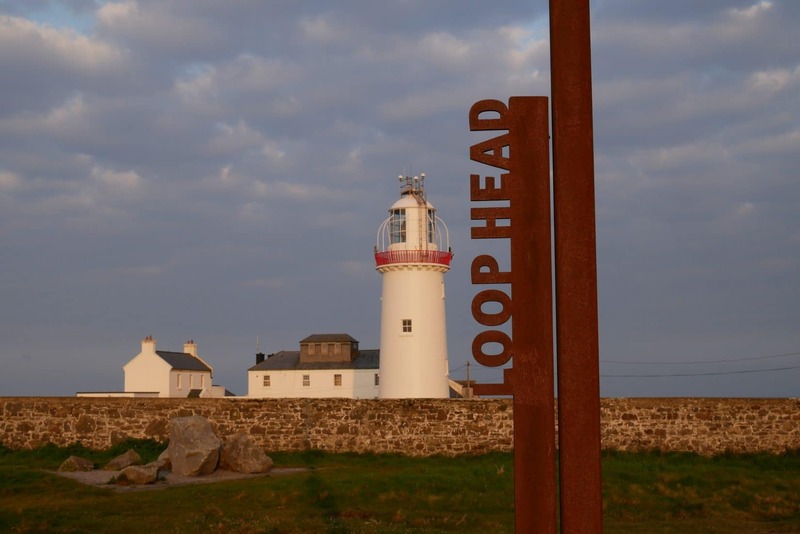 Loop Head and its lighthouse are unveiled quickly at the end of the road. The car park is almost empty, I will be able to enjoy serenely the place. The lighthouse is nice, there is the caretaker’s house next door and some technical buildings I guess. The whole is surrounded by a low wall. 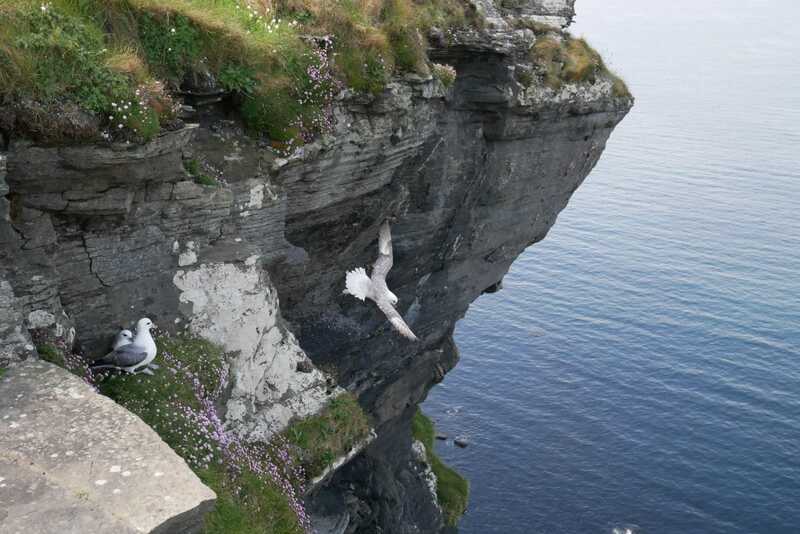 The head is beautiful, it is surrounded by high cliffs with a lot of birds that nest there. Unfortunately my camera lens does not allow to make satisfactory photographs of the volatiles … I stroll taking advantage of the quietude of the late afternoon. In the end, I choose to stay here for the night, there is nobody and it is not a small tent that will annoy anyone. So I settle the camp just beside the cliff and I prepare to eat, but, small detail, I forgot to buy gas for my stove … Fortunately there is a van that “camps” on the car park, its owner accept to boil some water for me, thanks! 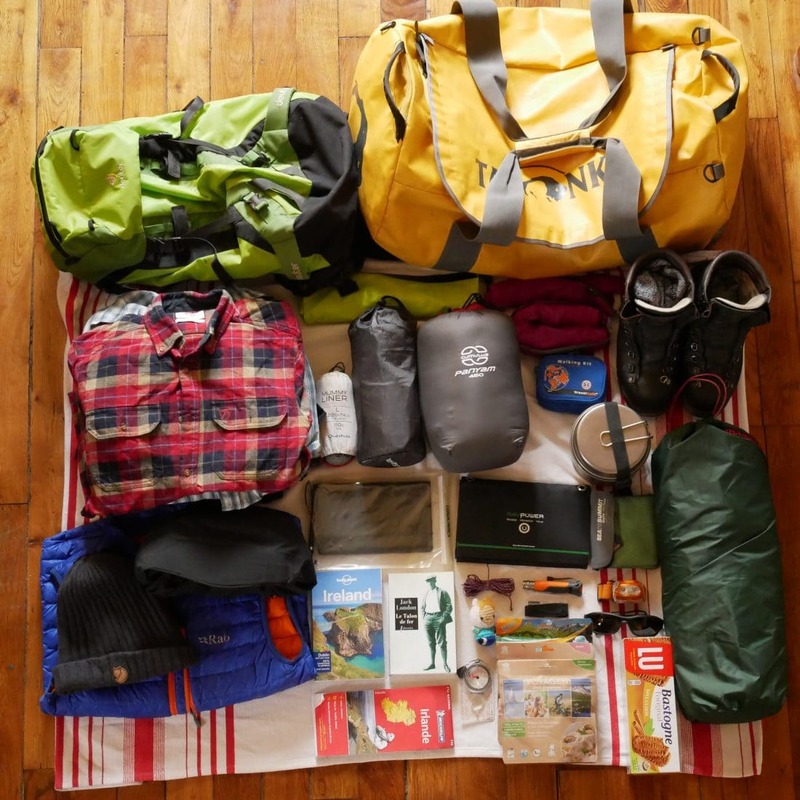 In Ireland and the United Kingdom, wild camping is generally tolerated. 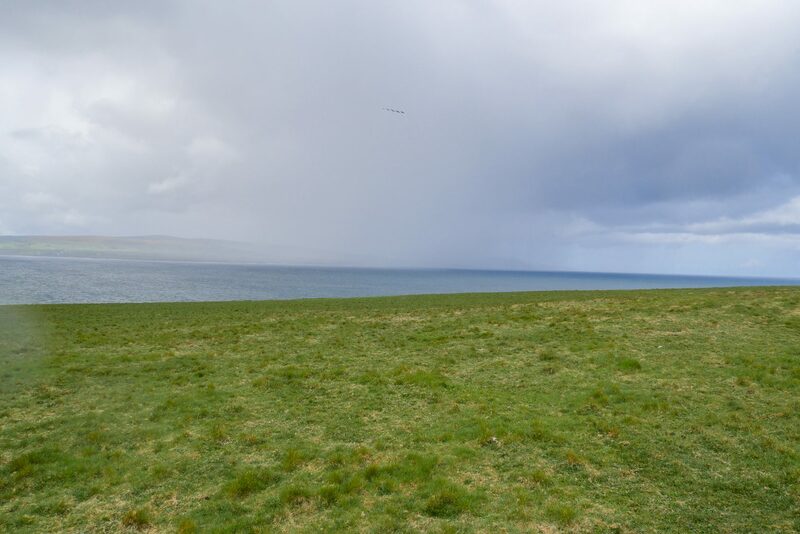 On the other hand almost all the land is private, so you must ask the owner before settling your camp, this one will generally accept and will even sometimes advise you about a nice place to stay. The main thing is to not abuse and especially to leave the camp absolutely intact after your departure. 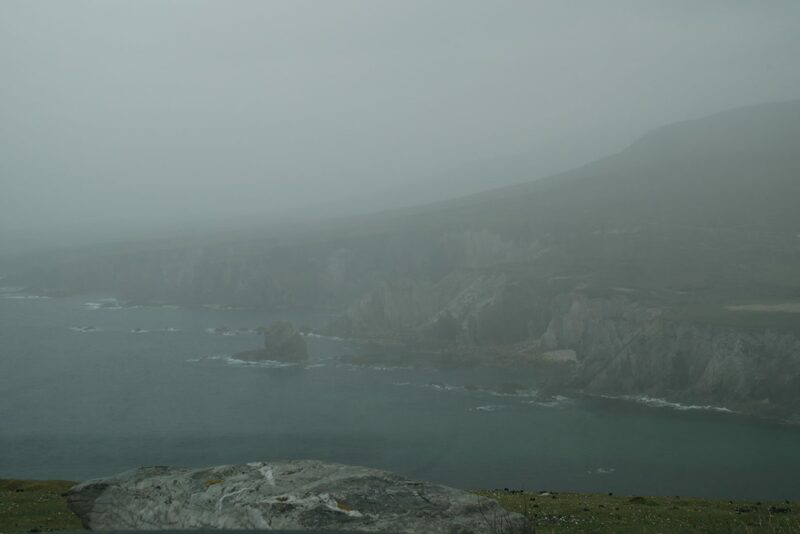 This is the first real day on my road trip along the Wild Atlantic Way. I’m back on the road quickly after an early morning wake around 6h … There is nobody driving this early; which is ok for me because it leaves me the field to “train” to drive left on the small roads. 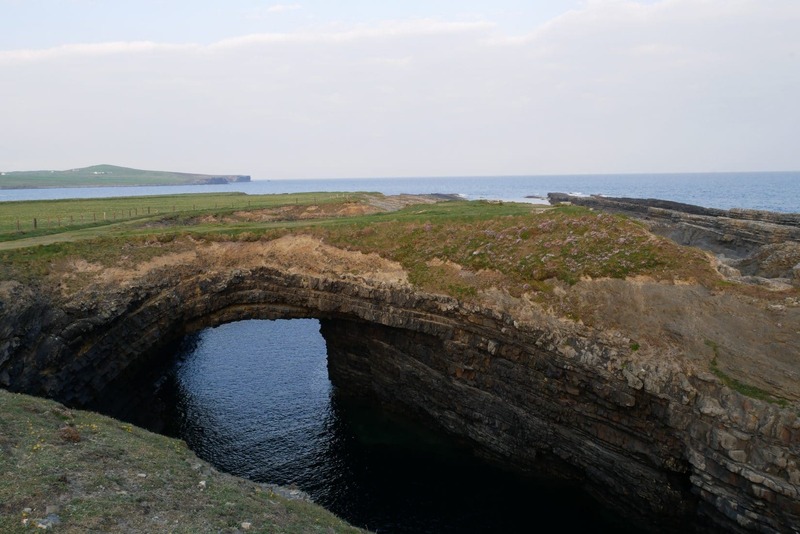 The first stop will be at the “Bridge of Ross”, a natural arch on a small stretch of sea and forming behind a small “pirate creek”. 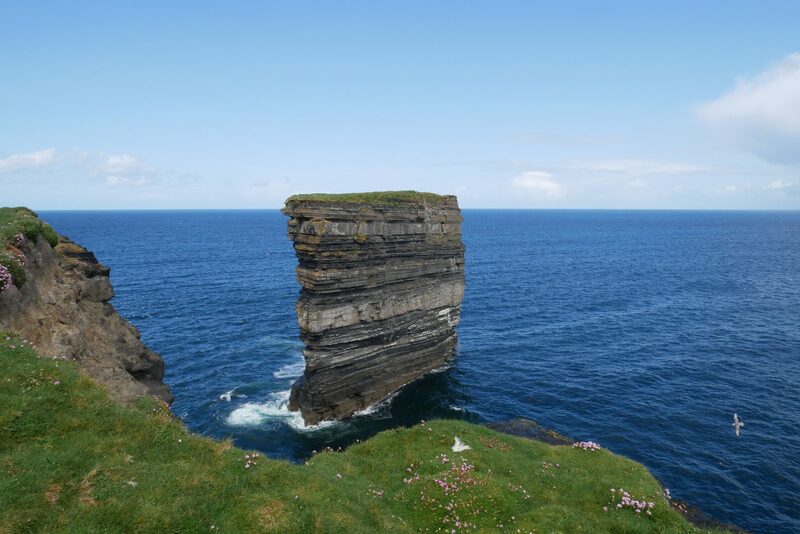 The road then takes me back to Kilkee, I pass quickly. I then follow the coast on pleasant but not marvelous sections. I quickly stop at Spanish Point but the beach is a bit disappointing. As time passes quickly it is soon 9am and I begin to be hungry. I make a detour off the circuit to Ennystimon, small city on the N67. The city would be nicer if there was no “big” road that crosses it through and on which there is quite a lot of traffic including trucks. All this removes a bit of charm from the pretty colorful facades of pubs and other shops. 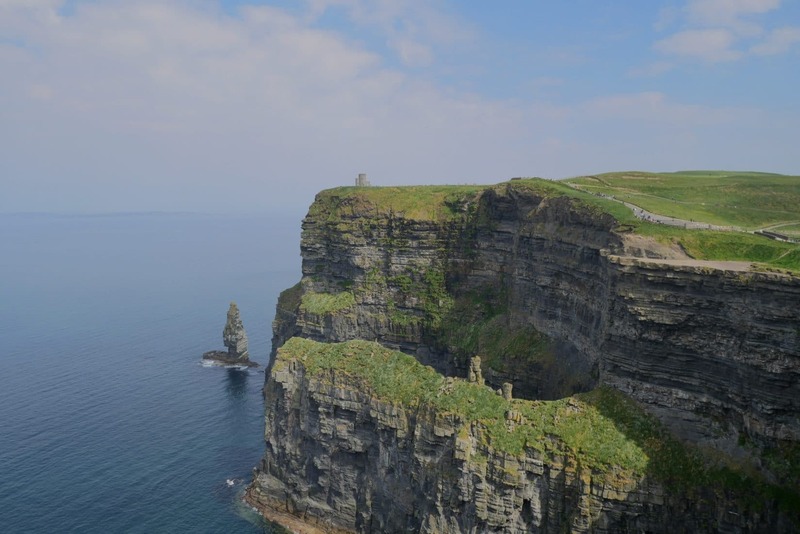 I drive in direction on the famous cliffs of Moher after this good break! These are not far down the road. It feels that it is a big tourist attraction when one sees the size of the car park, the crowd and the price to park: 6 € / adult. 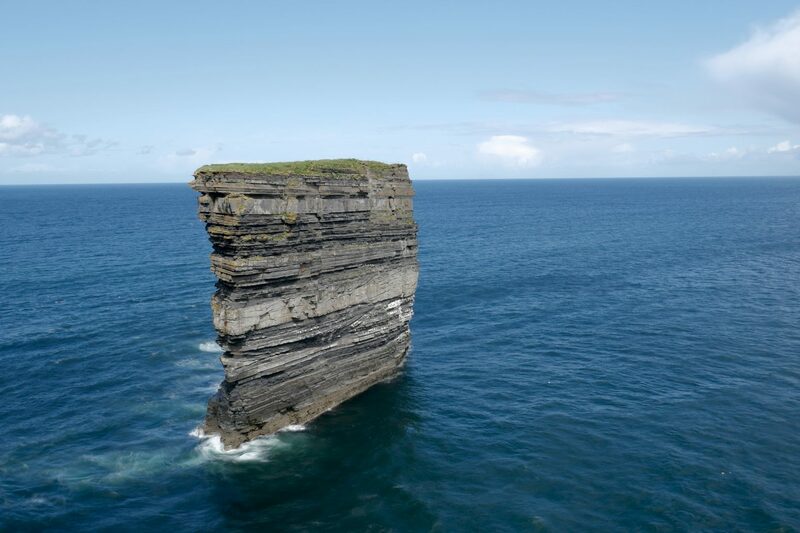 However, it is worth it because the cliffs are really beautiful. 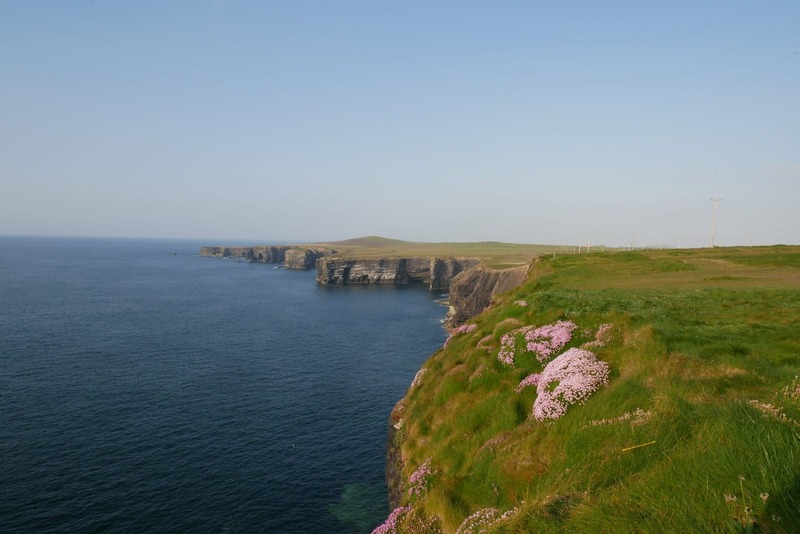 The site streches to the north towards the O’Brien Tower and towards the south for a walk along the cliffs. There are a lot of people but it’s not too disturbing but it is surely worth during summer. 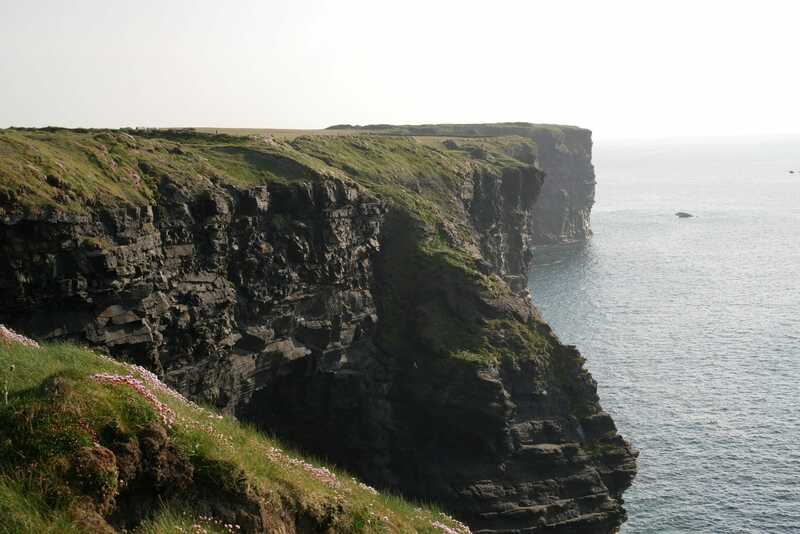 I begin my walk to the tower to admire the cliffs to the south. 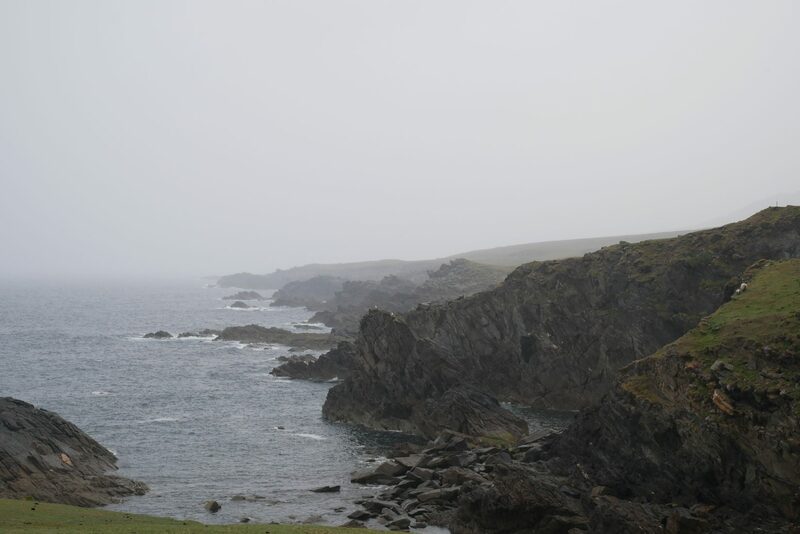 There is a bit of mist but it is really beautiful: the cliffs fall in the sea from the top of their 200m. 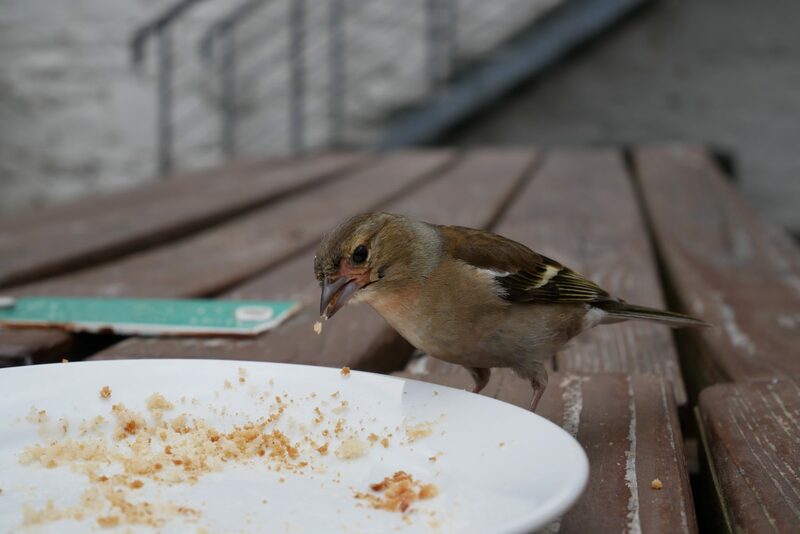 Many birds also nest there. 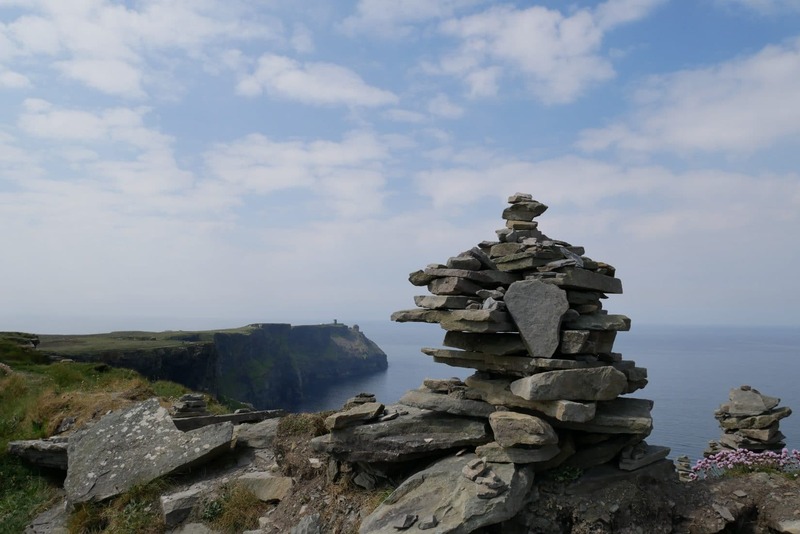 I then start the walk that runs along the cliffs towards the south towards Túr an Mhothair, a second tower with a nearby geocache. The walk takes 5.5km to go and is done round trip. There are a lot of people at the start but quickly we leave the (very) arranged path and the “crowd” is diluted. 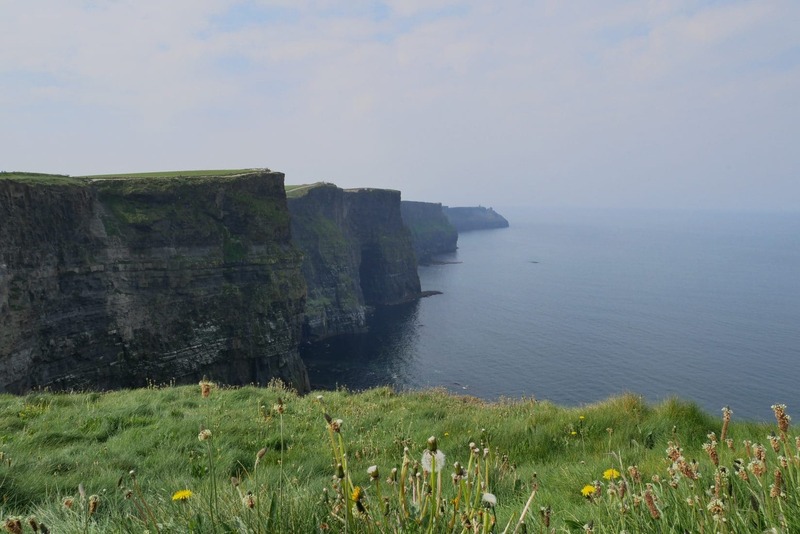 We quickly find ourselves in a calm setting along the vertiginous cliffs. Here we go again ! 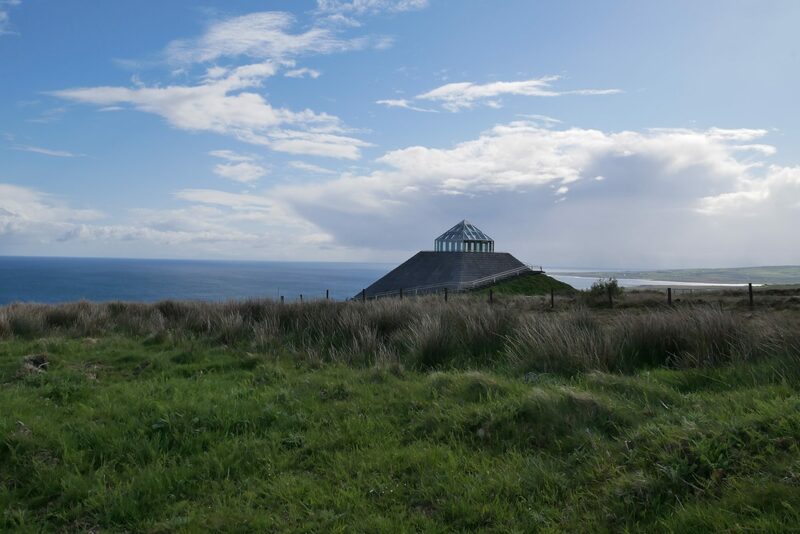 The Wild Atlantic Way runs along the coast on very small roads heading north. 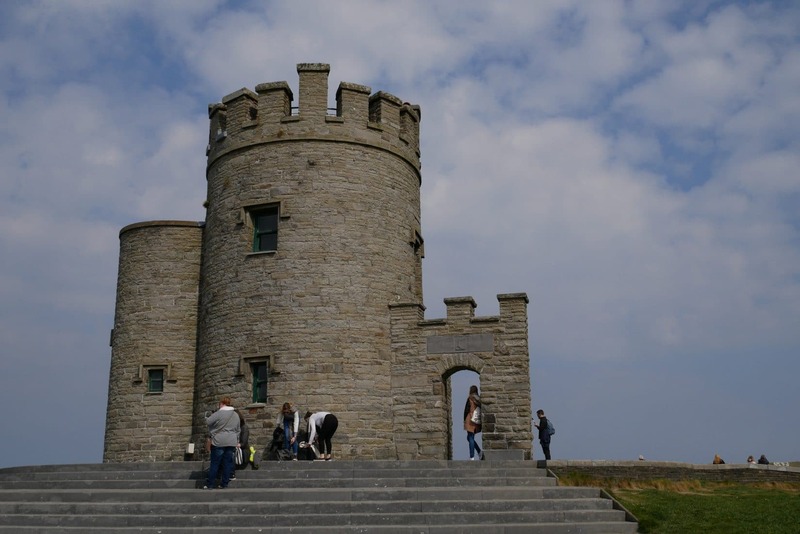 It is very beautiful especially as on the right (towards the east) unveils the moors of the Burren to which I will then take a tour. 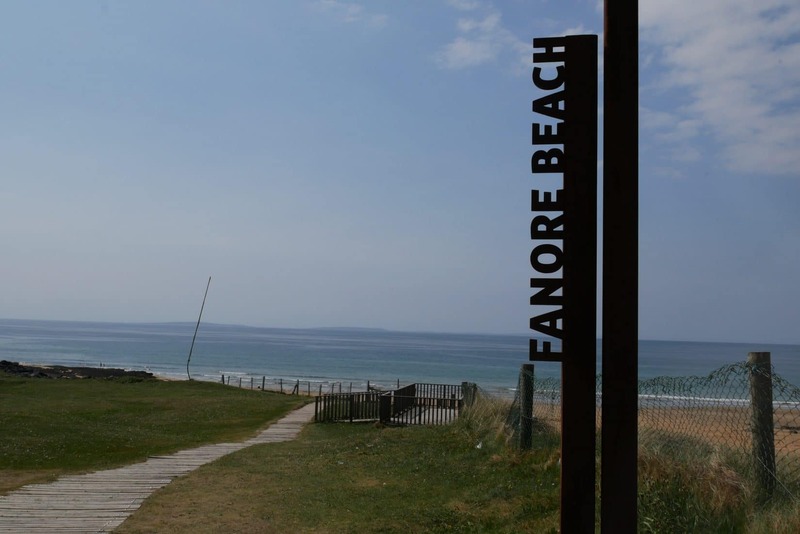 Before that I stop at Fanore beach for some pictures. 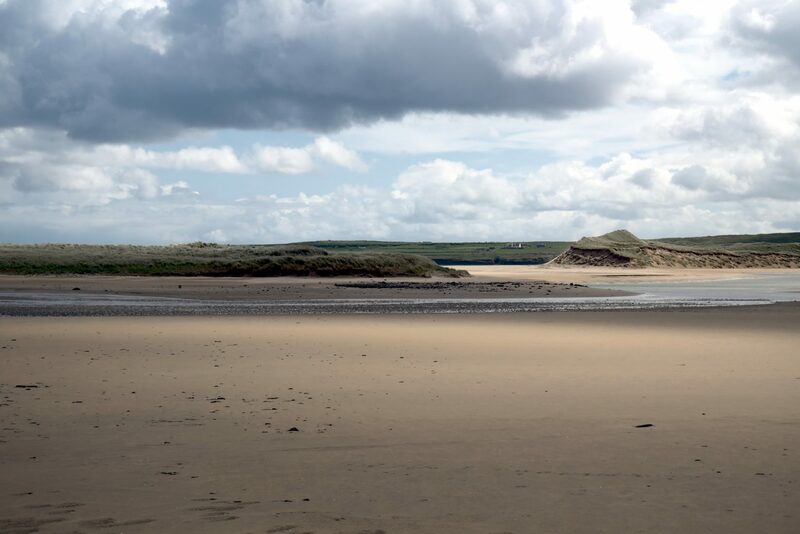 The road is still pretty and really not wide after Fanore beach. We go through a whole series of small villages, it’s nice. 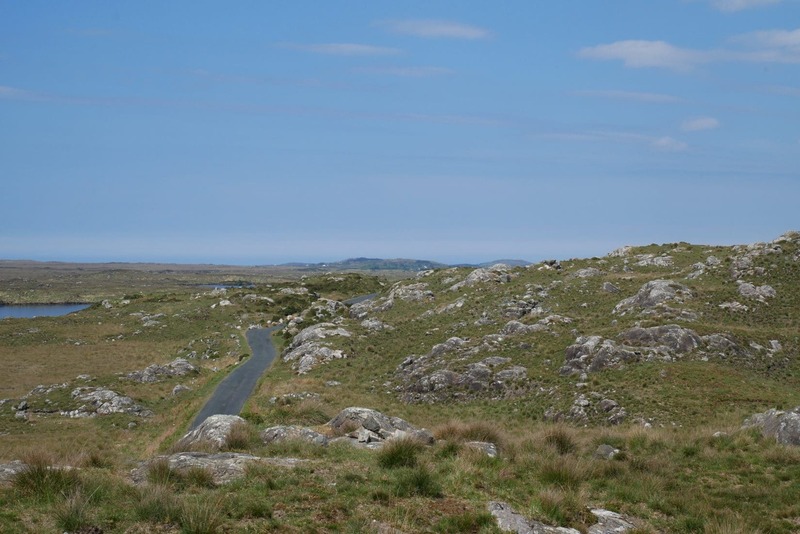 I fork south following the N67 then the R480 to Ballyvaughan towards the dolmen of Poulnabrone. 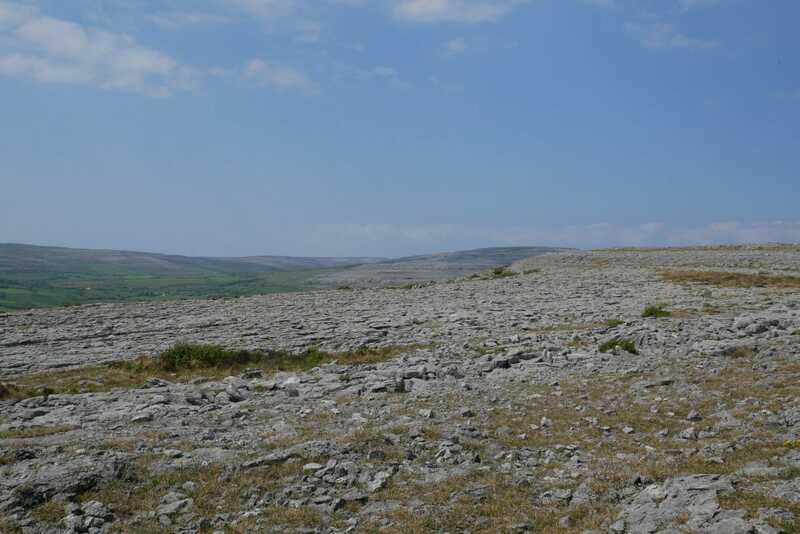 The R480 evolves in the Burren it’s beautiful. 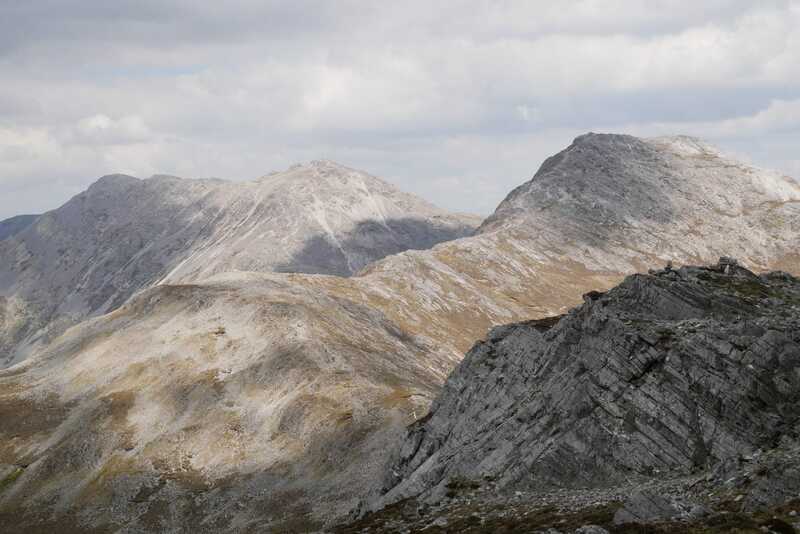 This region is made up of moors with many limestone rocky outcrops with white hues bringing aesthetics to the landscape. I quickly reach the site of Poulnabrone. There is no one when I arrive, nice. There are some explanatory signs on the way to the dolmen. The latter dates from a period of -4200 to -2900 years, ie from the Neolithic. 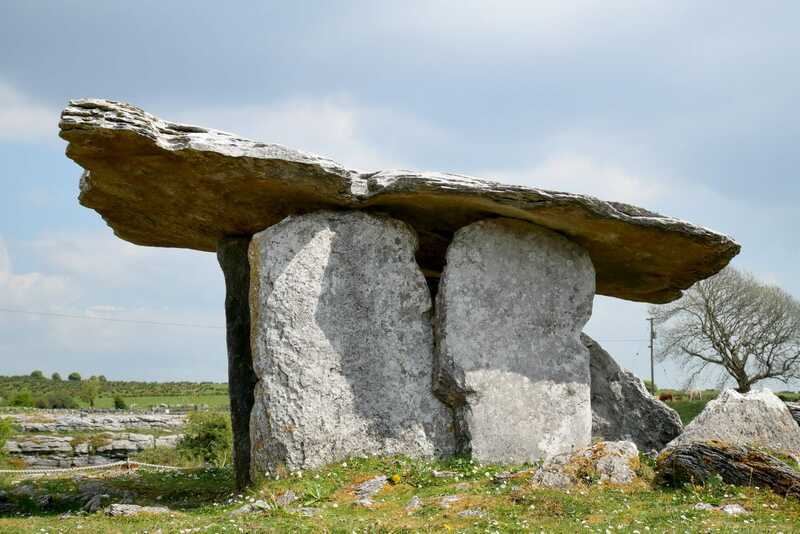 The dolmen itself is composed of a large relatively thin slab resting on two vertical stones called “portal stone”. 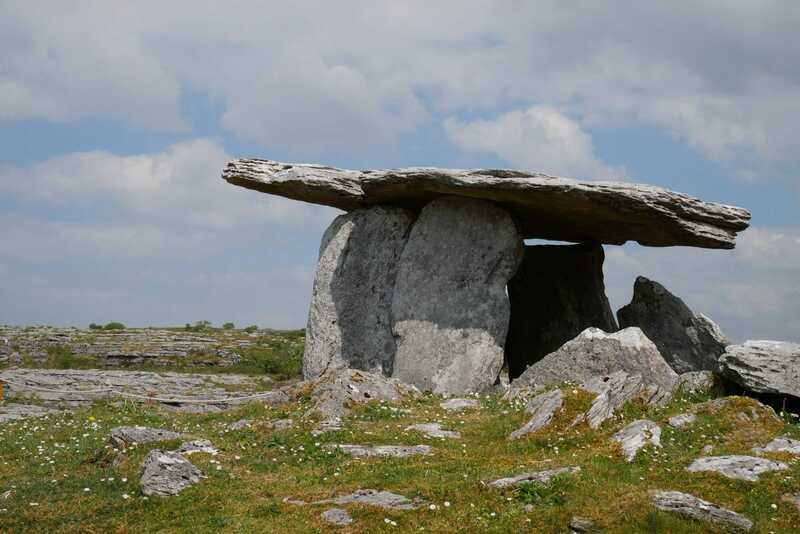 The whole gives the dolmen a portal look indeed. The site is a grave, 33 resting people have been discovered (adults and children) as well as many artefacts. It is impressive and beautiful. It’s worth the little detour. Half turn. I catch up with the Wild Atlantic Way towards Galway. 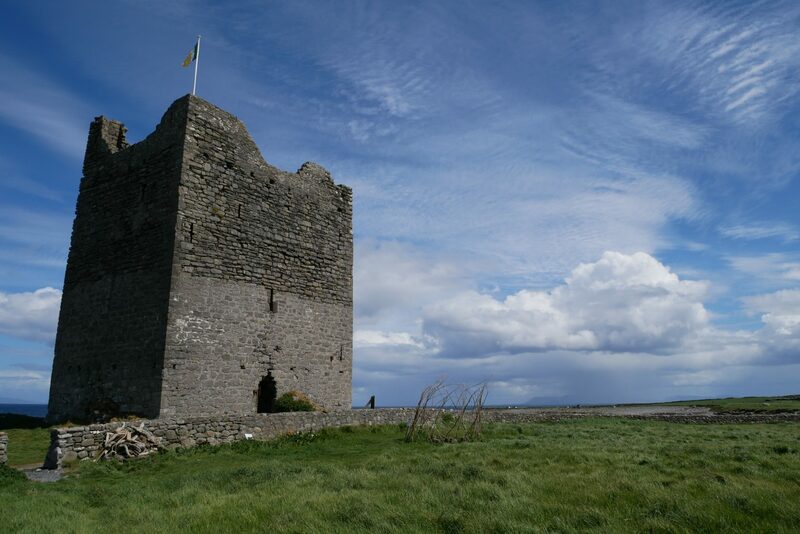 I stop on the way to admire the castle of Dunguaire which is a bit of a model of the kind. It is about 17:30 and the arrival on Galway will be in the caps of the exit of work. I leave the car in a car park in the city center and I get my room at the Kinlay Hostel. It is a friendly hostel and especially perfectly located in the city (about 20 € per night in dormitory). 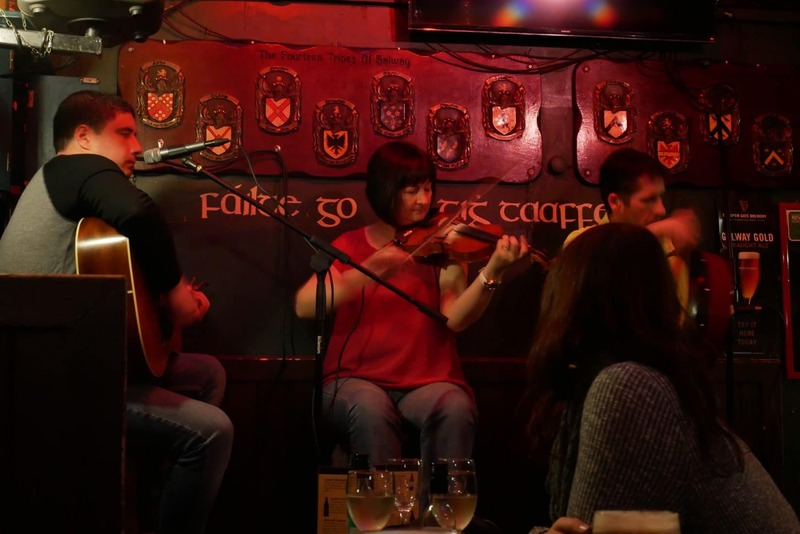 Galway is a small town that has charm and looks dynamic. Lots of people in the streets and terraces to enjoy the sun. 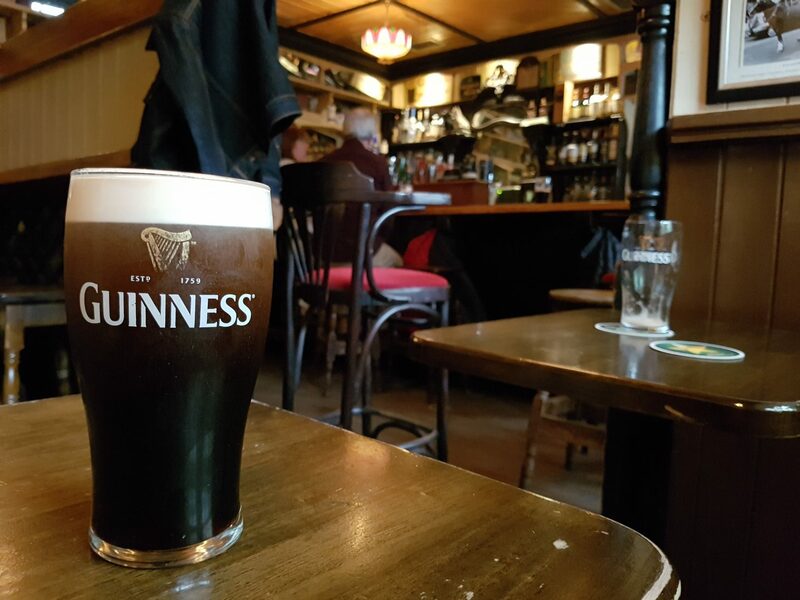 I will finish my evening with my first pint of Guinness in a real Irish pub. 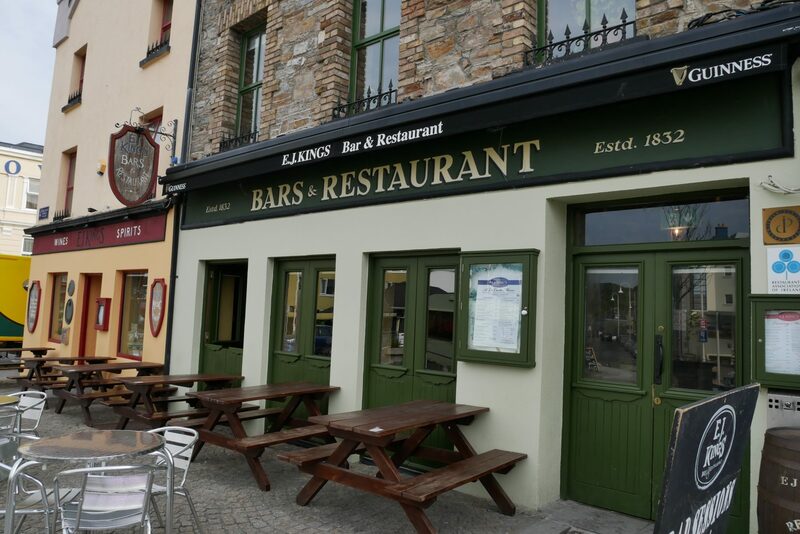 I will start with the Quays and then I will go to the Taafes bar to listen to traditional music. The atmosphere is very friendly and there is a lot of people even for a weekday. 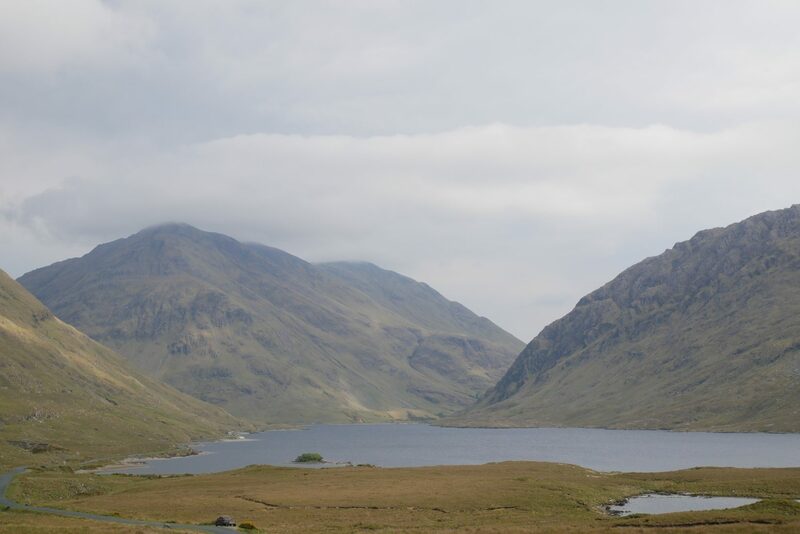 After this soft night rocked by the snoring and the guttural noises of my neighbor of room, I am back on the road a little tired towards Connemara! 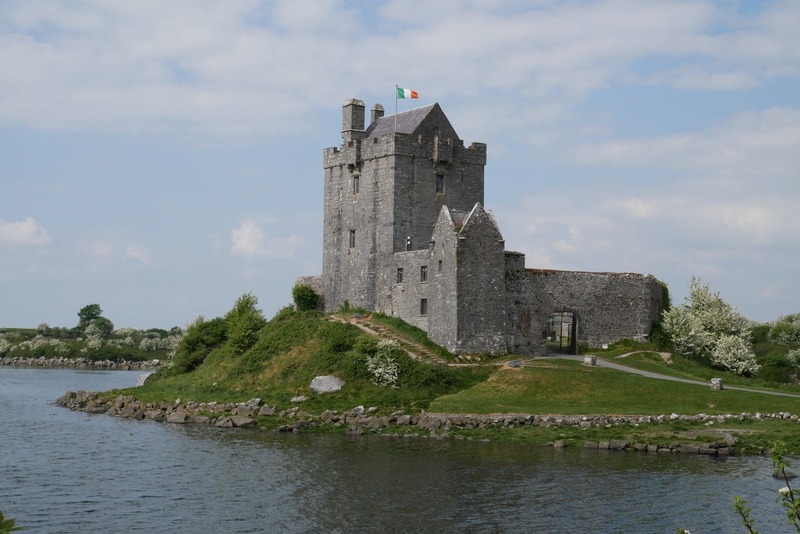 It is the region I most want to discover during this trip because it looks beautiful and “authentic” even if I do not like this adjective, to say it otherwise I hope the traditional and local Irish culture is still strong. I am back on the Wild Atlantic Way at the exit of Galway. 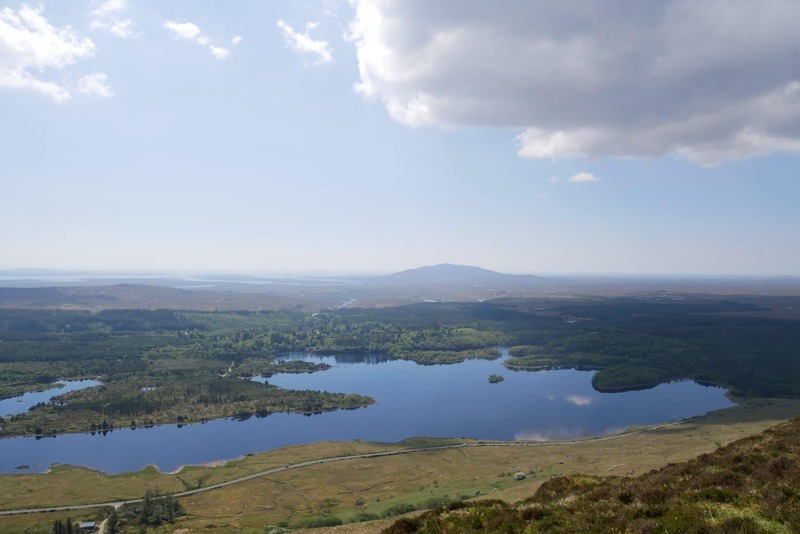 The beginning of the road is not interesting but slowly the urban density decreases and we begin to perceive the moors of stones of Connemara. 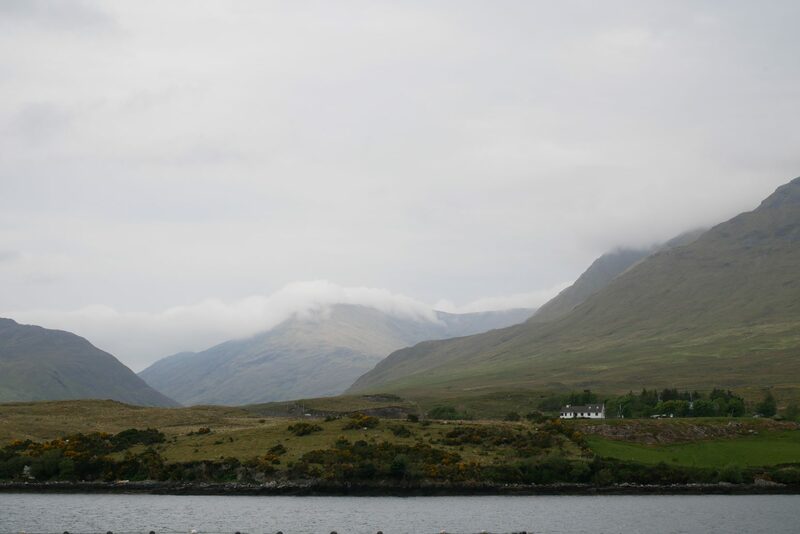 The landscape actually changes after the small airfield to Indreabhán. The R336 is following the coast and one passes through pretty villages. In the distance one begins to perceive the hills (big hills of 700m for the biggest ones). I make a few stops in small seaside villages that offer pretty little ports or beaches of white sand; the whole is very charming. The road is really getting more and more beautiful especially when you enter the R342. 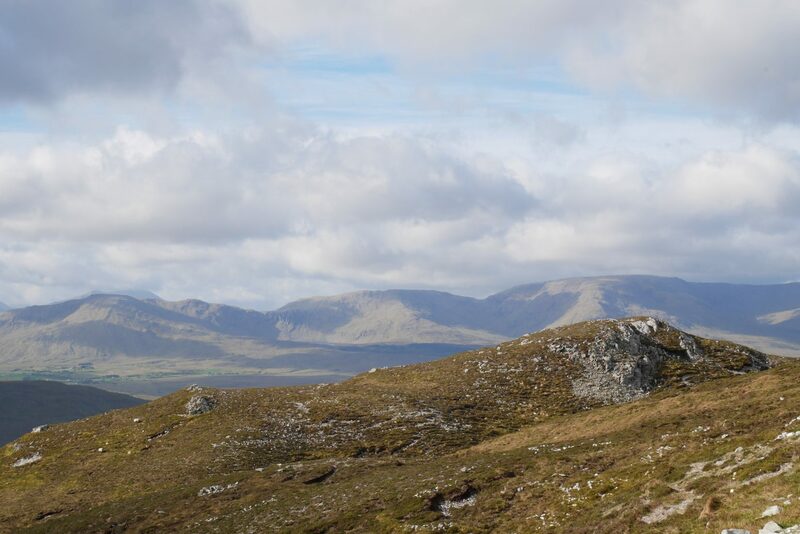 You can see the “Bens” to the north these big hills (or small mountain) that give its character to the Connemara. There are not many people which allows to enjoy the scenery and driving (especially since now I finally master the left-hand drive and especially shifting gears). 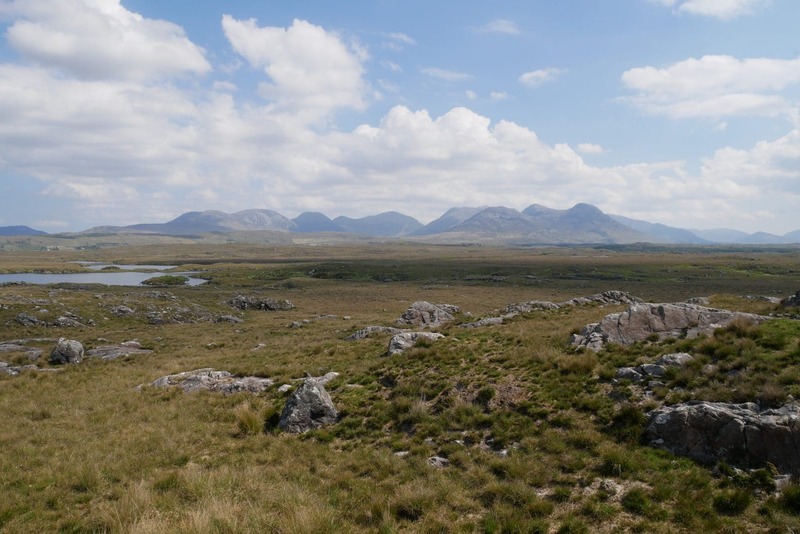 As I want to “explore” the Connemara roads, I leave the Wild Atlantic Way a moment to cut through the “Roundstone Bog”. The road that crosses this marsh is absolutely superb and offers a striking panorama. I can not find its name but it is easy to find the bifurcation that leads to it in one direction as in the other. I recover and turn left on the N59 a little after Ballinafad. 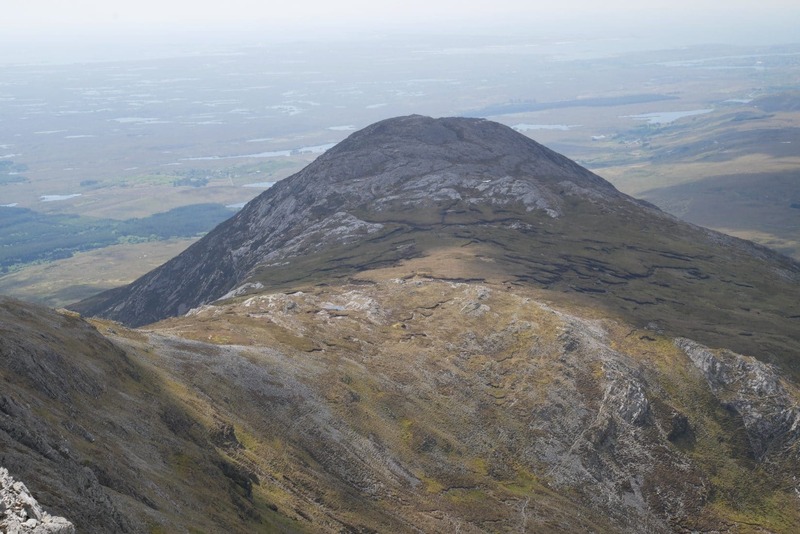 The beginning of the Ben Leitri ascent is located at the youth hostel of the same name a few kilometers to the west (towards Clifden) (GPS coordinates: 53.4728933, -9.8624709). There is room for parking, it is relatively convenient. 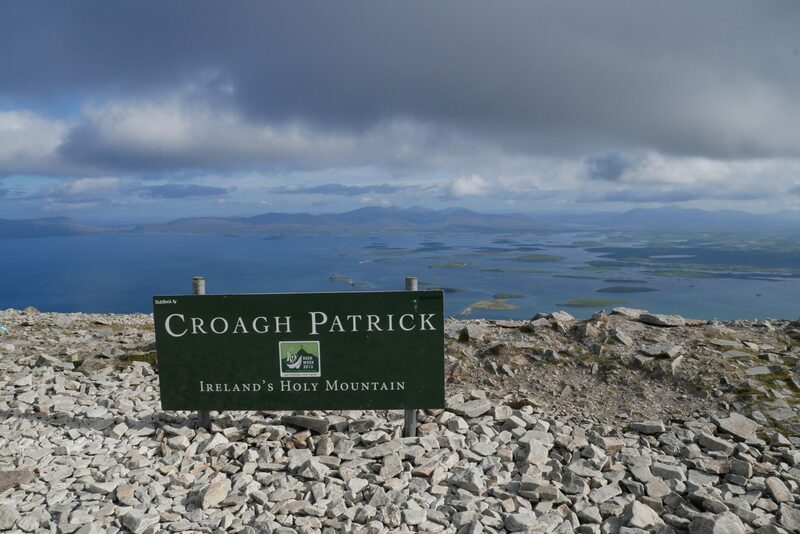 I start looking for the beginning of the course after changing for the walk and I come across the owner of the youth hostel, an American woman from Los Angeles who has lived in Ireland for 17 years (I no longer have her first name …) with whom I discuss a little about the best way to the summit. She also lends me a card, very nice. 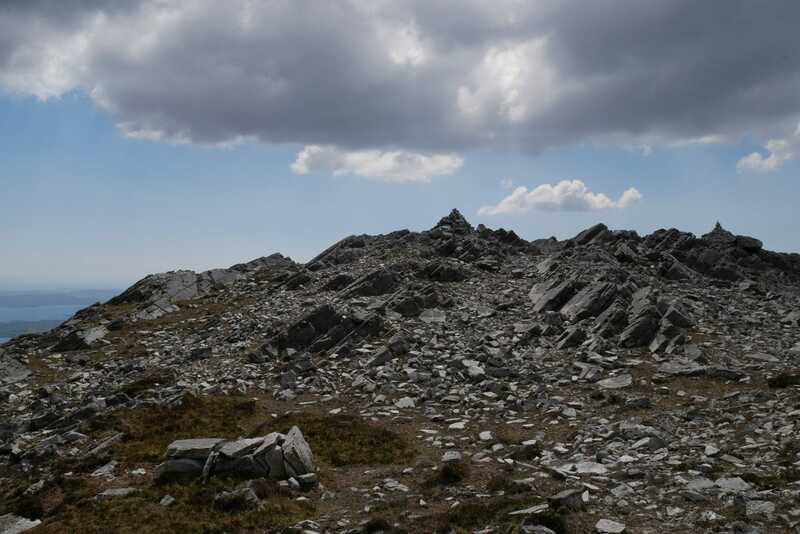 The summit is not very high: 557m but there is not really a path so you have to trace it yourself. The start of the hike goes up well and mostly evolves in sheep meadow with large clumps of grass that destabilize a little walk. We quickly arrive at a kind of shoulder after some small cliffs more difficult to pass. In general people are going westward to get around the summit but I choose to follow this shoulder to the northeast and “shoot” right on top. It looks practicable and I am following the paths traced by the sheep. In any case the landscape that is offered to me to the south is already very beautiful! The summit is finally reached fairly quickly even if it climbs strongly. In any case no big difficulties for someone who is used to moutains (by cons in rainy weather it must be more complicated because the ground must be slippery). 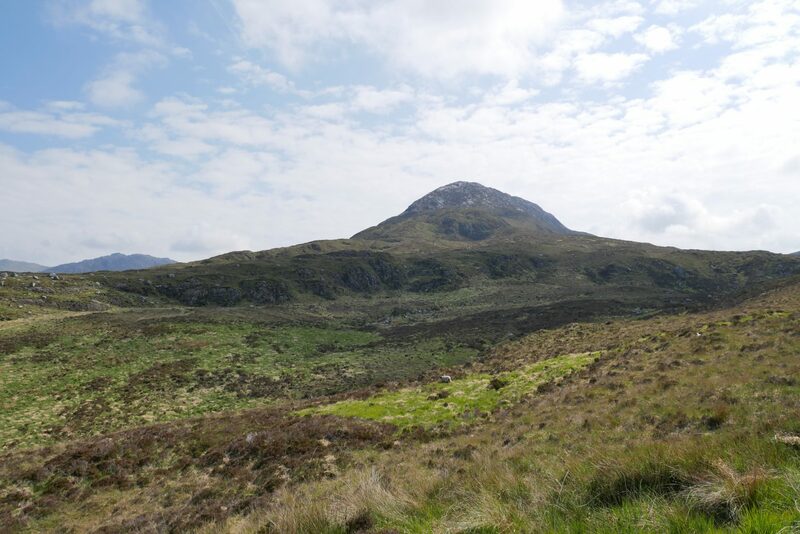 As Ben Leitri’s climb was faster than expected, I decided to push up to Glengower (or Bin Gabhar) (664m) because it will offer another view and that there is only 70m to climb. For the descent I will follow a different path passing between Ben Leitri and a secondary summit in a horseshoe valley. No particular difficulty with the descent except small portions of cliffs less practical to pass. 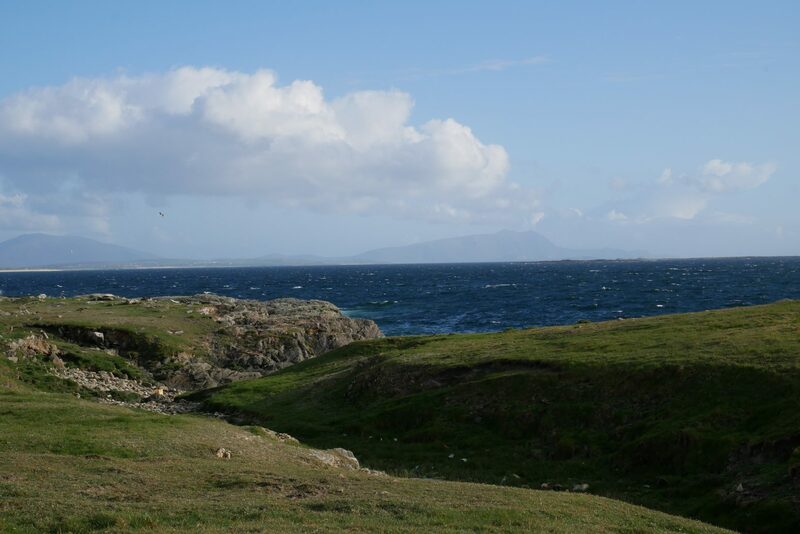 Once back at the hostel, I return the map and take a small tea offered by the owner before heading back to Clifden. 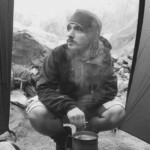 I will not stop there because I wanted to go to a campsite where I will spend the night. 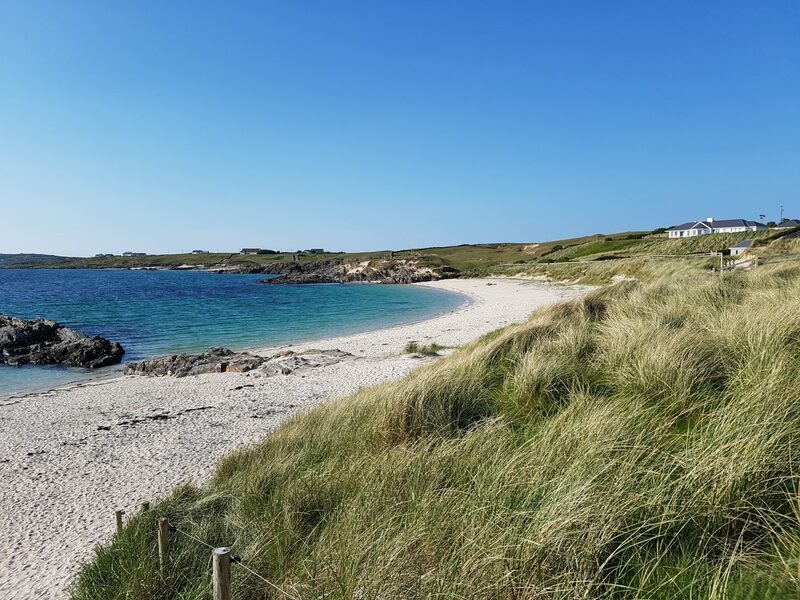 So I head towards the “Clifden ecoBeach Camping & Caravanning Park” which offers a large expanse of grass and a nice view for the night. The campsite itself is not extraordinary but it will be ok for the evening. 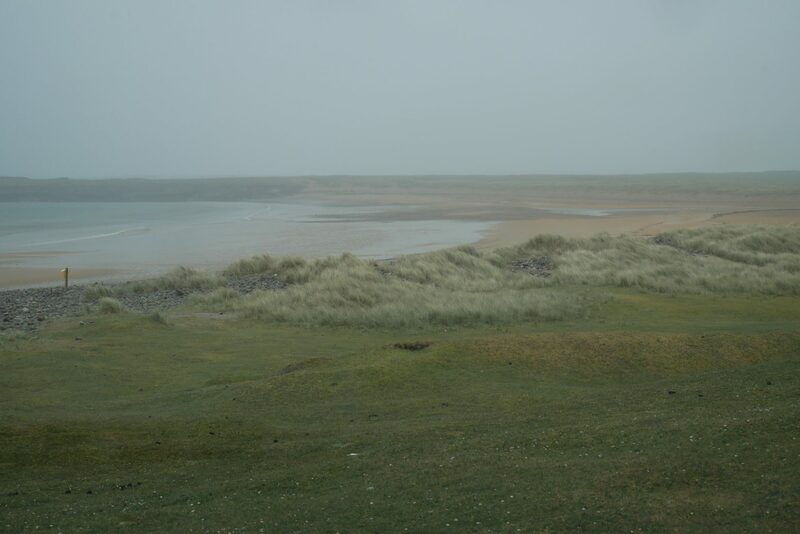 The nice point is the presence of a white sand beach “in” the campsite. Another beautiful day that begins! 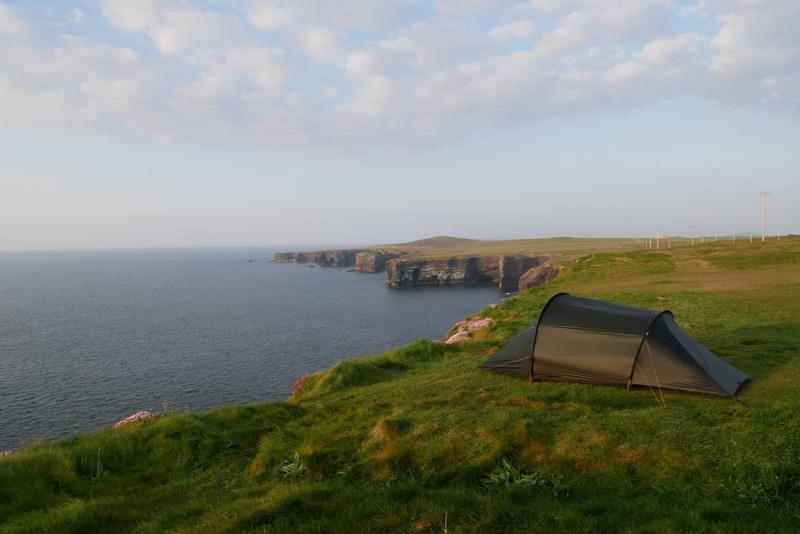 It’s early, around 6:30 am, I unset the tent and head back to the Wild Atlantic Way. 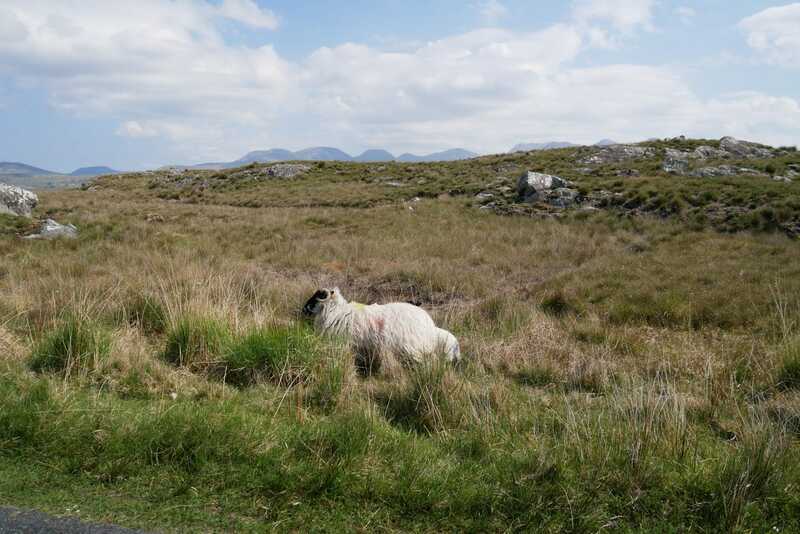 I go back in direction of Clifden to refuel because I have already done a lot of kilometers. Before that I fork on the famous Sky Road, a road that runs along the cliff offering beautiful views. Obviously there is nobody at this time so it is nice to drive on these tiny roads. 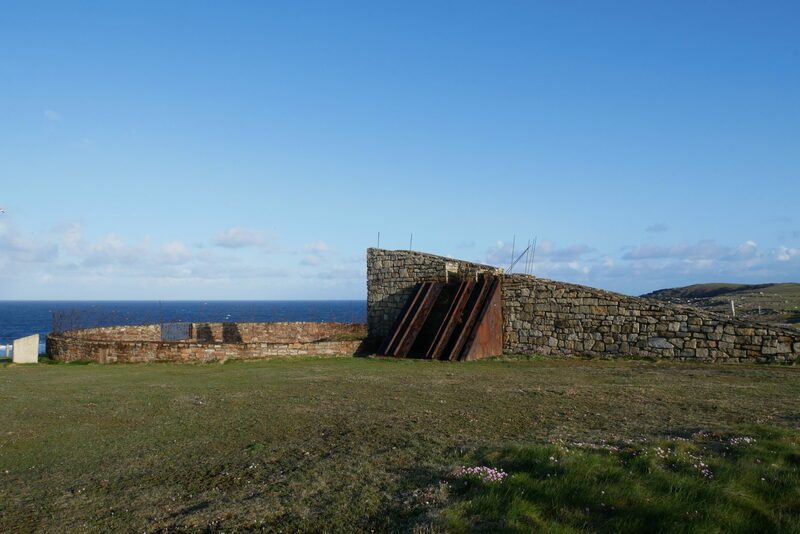 The “highlight of the show” is the observation area provided at the highest point of the road and allows to admire the coast and the surrounding islands. The road then follows the coast and passes through very small tracks. 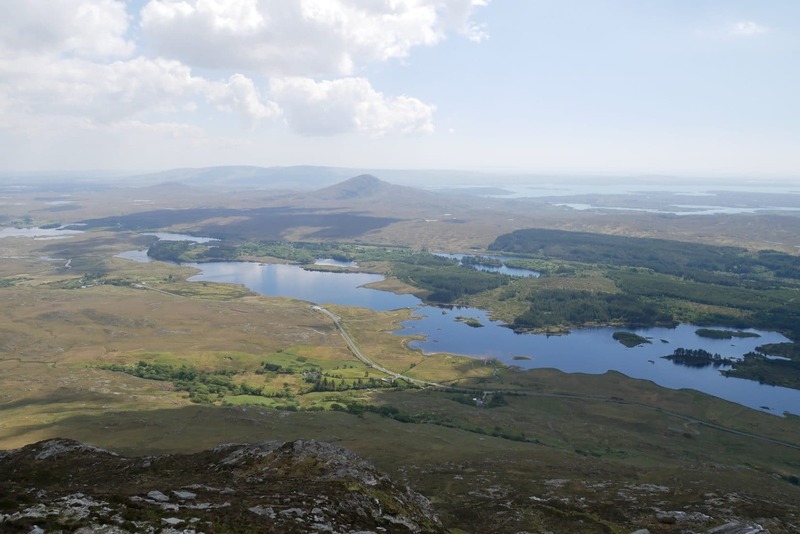 We then join the N59 on which I stay in direction of Letterfrack and Connemara National Park in order to climb Diamond Hill. The car park is not far from the Visitor Center which is also the beginning of the hike. 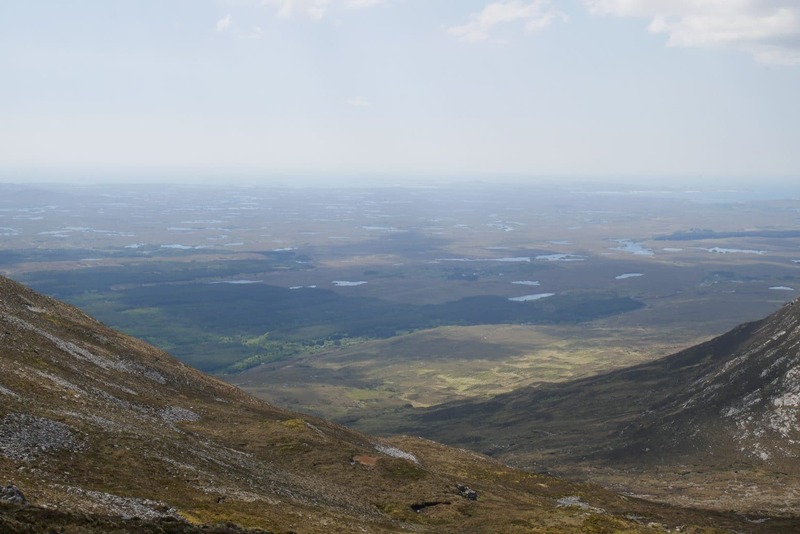 It is not a very difficult walk and everything is well indicated, so it is to do if you do not want to find yourself in the moor like on the Ben Leitri. 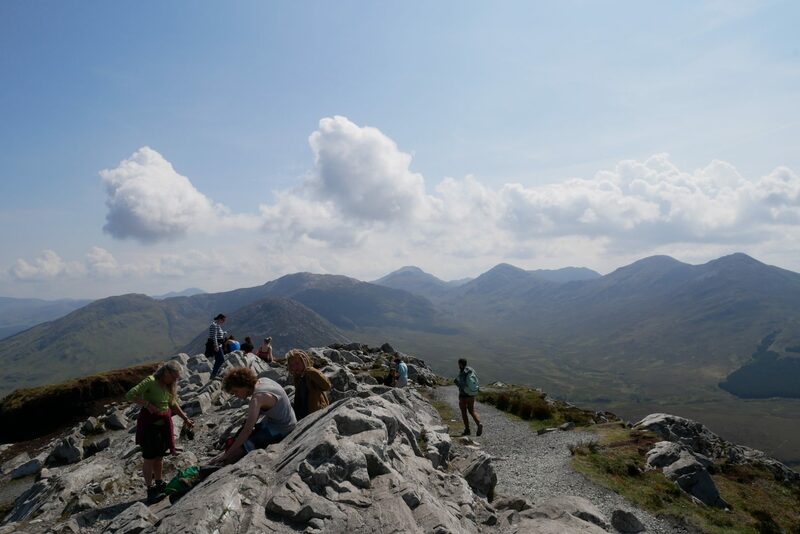 The summit (442m) reaches quickly and offers a beautiful view again (especially with the beautiful weather). I find there Romain and Cécile (or Céline I have a doubt …), two very friendly Swiss whom I met on the ascent. 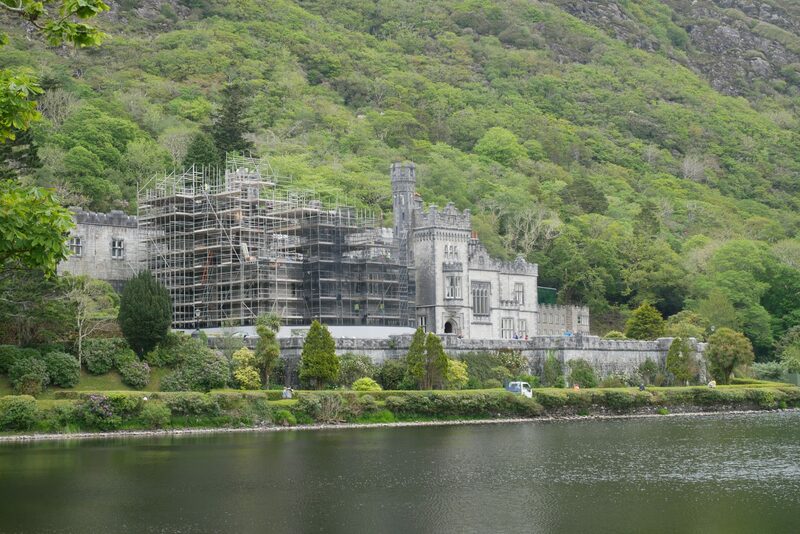 Then I head for Kylemore Abbey a few kilometers away. 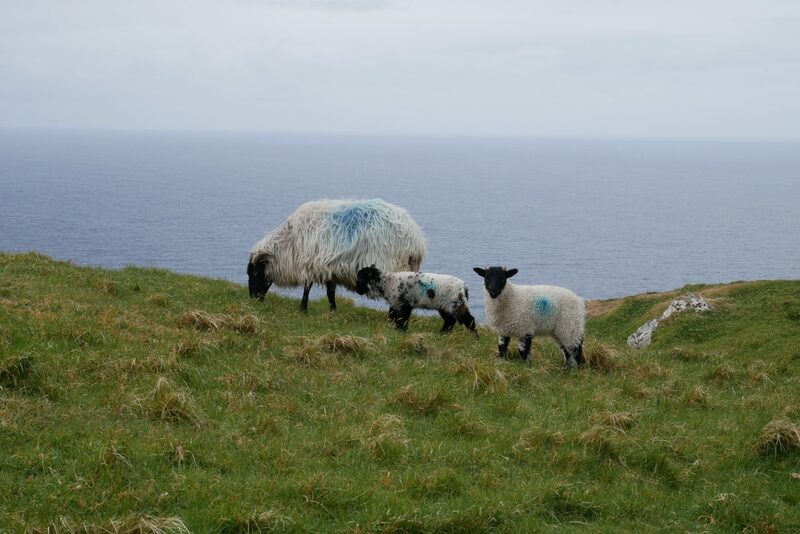 I then turn back to the Wild Atlantic Way. 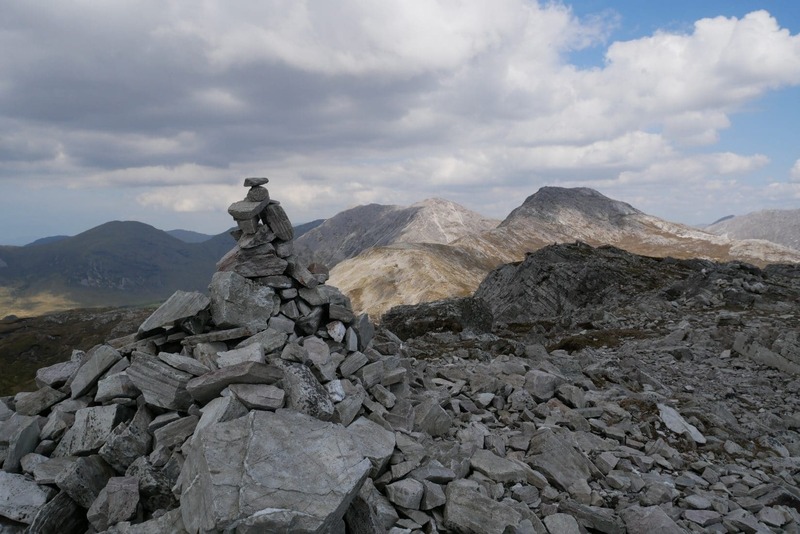 To Tully Cross and Rinvyle. I will also make a hook to the Rynvile Castle but this one is of no interest. The roads are not really wide on this portion but the scenery is beautiful again. 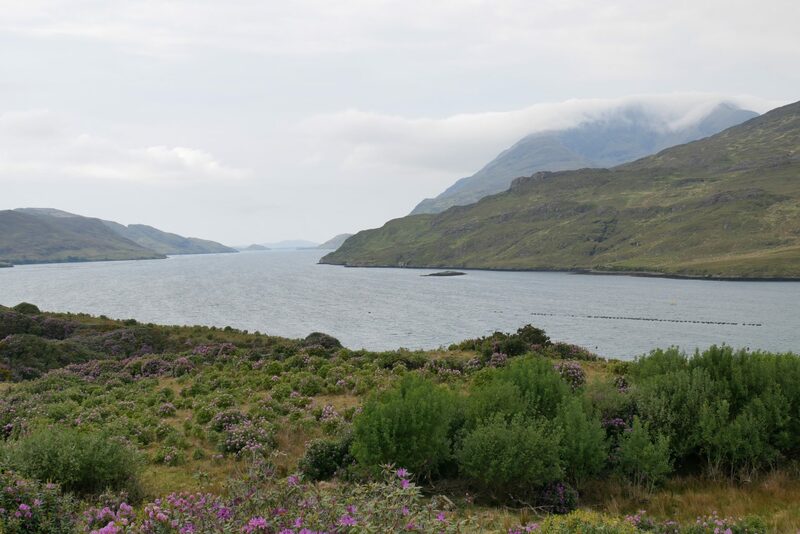 We then join the N59 to follow Killary Harbor which is, according to some, the only fjord of Ireland while searches think that no … In any case the stretch of water offers a beautiful landscape with the surrounding hills. 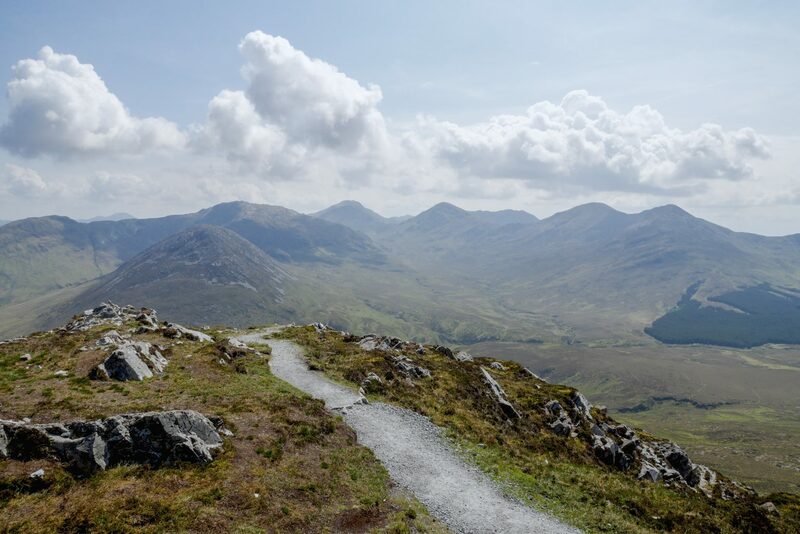 The Wild Atlantic Way then goes westward following the R355. 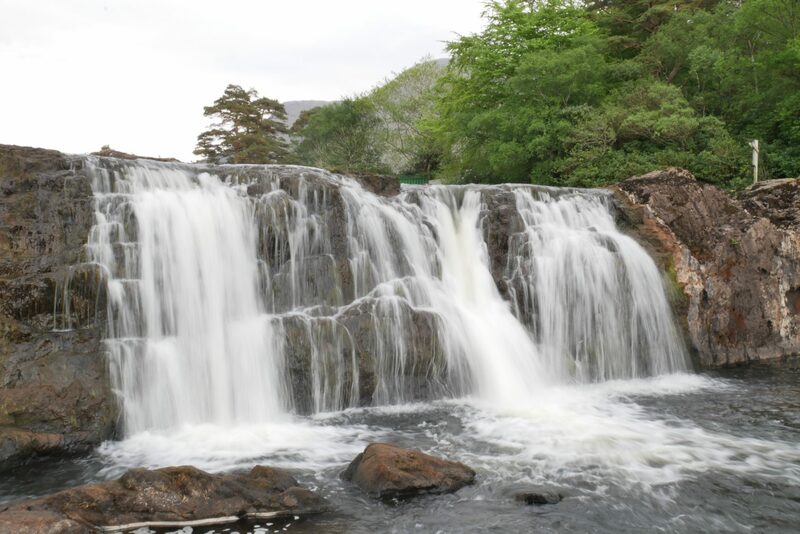 One passes by the cascade of Aasleagh which is pretty and one then penetrates in the valley of Doo Lough. Here the road is really beautiful and the landscapes are very wild. 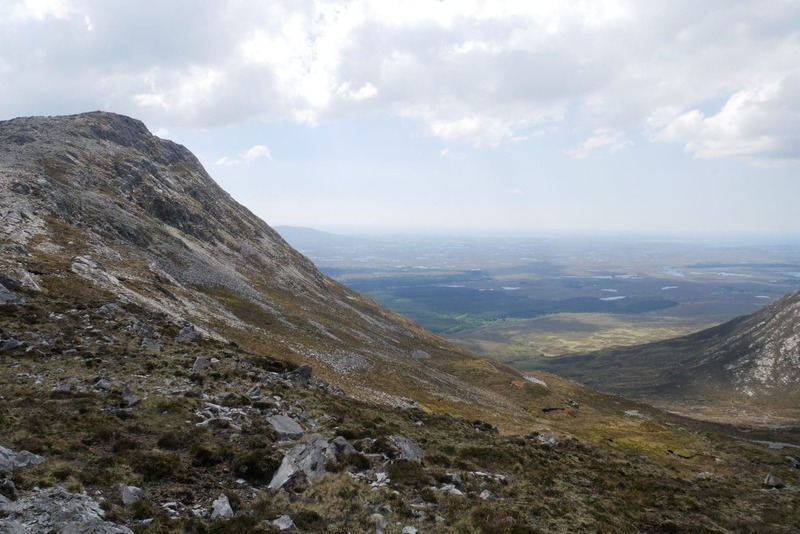 The Wild Atlantic Way then passes through less pleasant roads and villages (everything is relative). 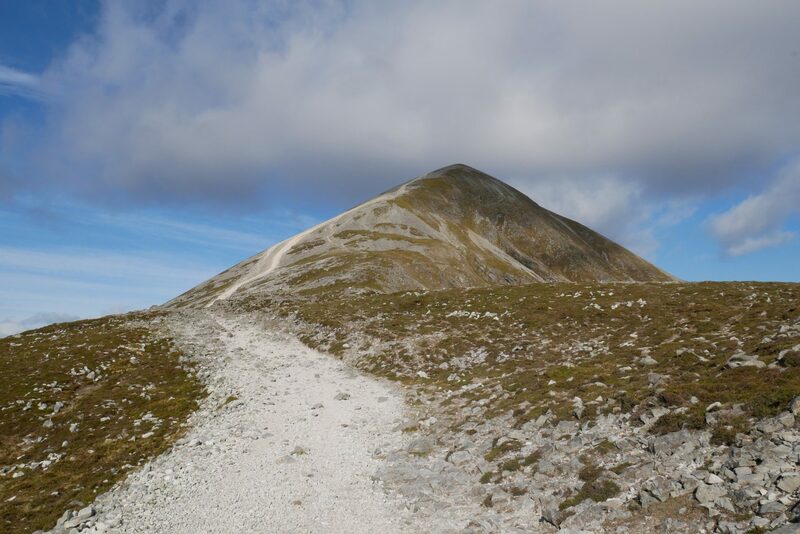 I then follow Croagh Patrick, the Holy Mountain of Ireland which I will climb tomorrow. For now direction Westport to find a place to sleep and go to the Pub. I take a room at the Old Mill Hostel, a hostel run by two super nice and very accommodating guys. The building is an old granary of the nineteenth which has a lot of cachet. Westport is a pretty village with a lot of activity. 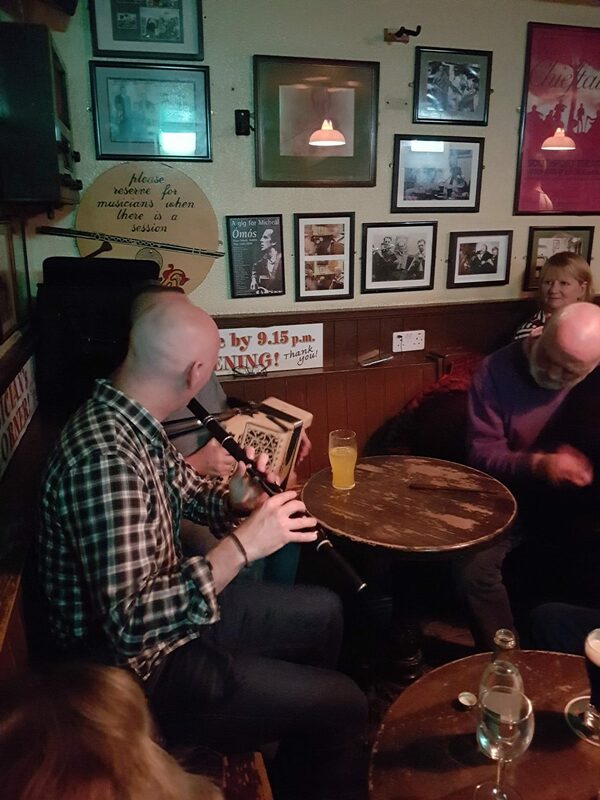 As for the evening, I will spend it at the Matt Molloy pub which is typical and which offers traditional music played every day. A very nice evening with a good atmosphere and good music. 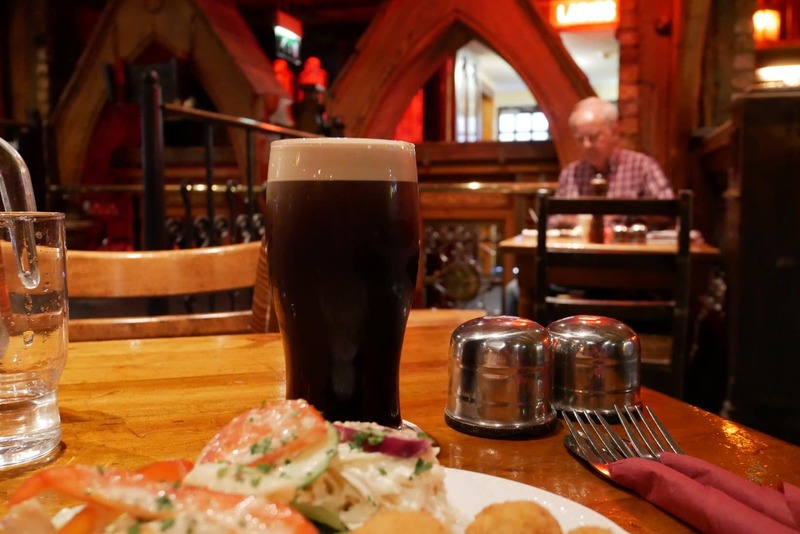 I love the mix in pubs because it is really a place where locals meet and are mixed with tourists. 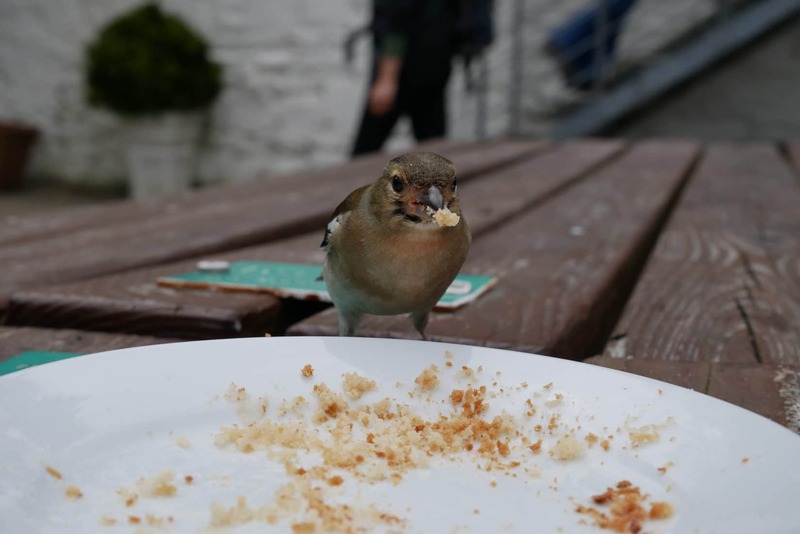 It’s friendly, good-spirited and easy to talk to locals. From my side I arrive at the parking lot around 7:45. The latter is located in the village of Murrisk. Obviously the parking is charged … The worry is that it is expensive and that I do not have many coins and the tourist center is closed I can not make change. I will meet a lot of people on the descent who have had the same problem. You have to provide about 5 € (coins) I think to be comfortable with timing. I have, finally, the right to stay there until 11am which leaves me 3h return … It is short since the climb is given in 2h30 and the descent in 1h30 in general, I So have to speed! I begin at around 8h once ready. The beginning of the path is well marked and the path is and will remain totally evident to the top. The beginning of the road goes up well. 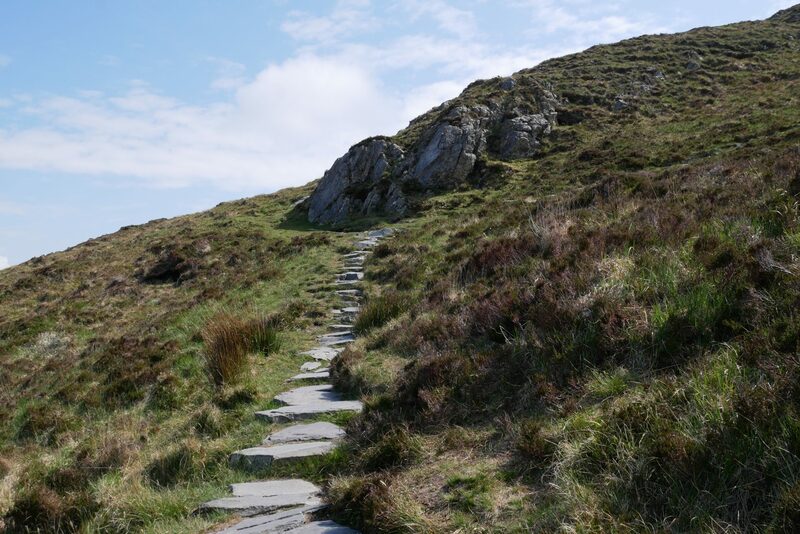 It is not very difficult but the repeated passage of thousands of people eroded the path to the rocks. We therefore evolve in a stony ground in which it is better to have good shoes I think (especially for the descent). In spite of this I advance well and I double three walkers who had left a little before me. 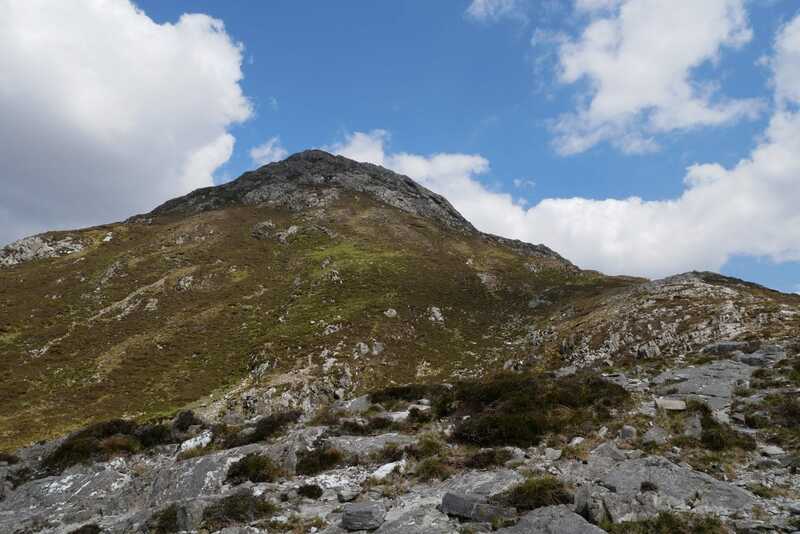 It is on this portion that one really discovers the pretty conical shape of the mountain. 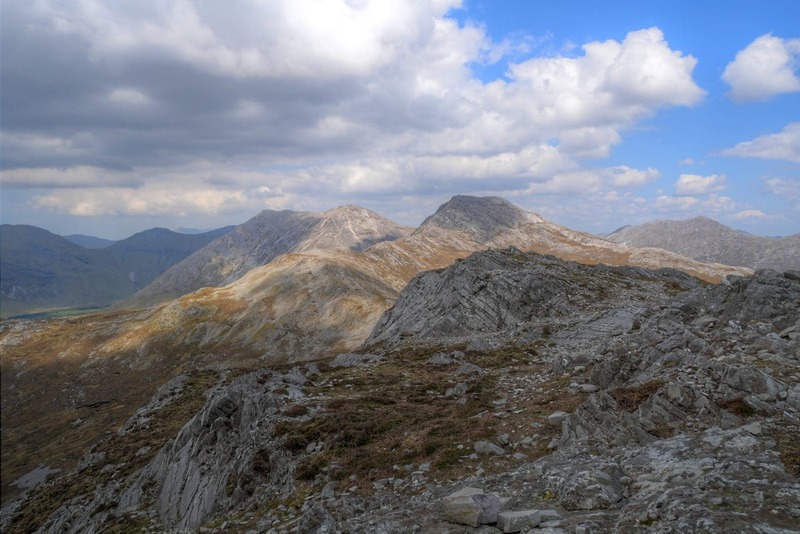 The path here offers a beautiful view thanks to the long white trail to the top. 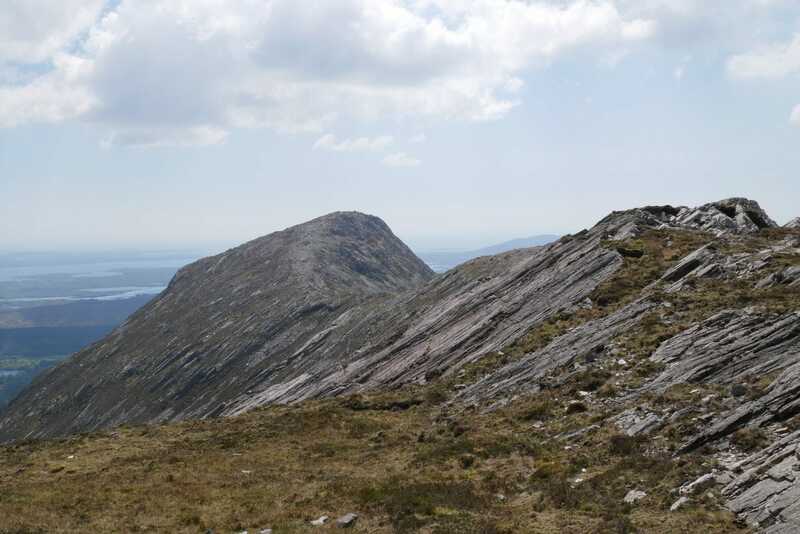 The last part of the trail is quite steep and, above all, is covered with large, somewhat unstable stone. It is therefore necessary to privilege the edges of the road to go up. In the end it goes well and I arrive at the summit in 1:20 finally! I am happy, I went fast. 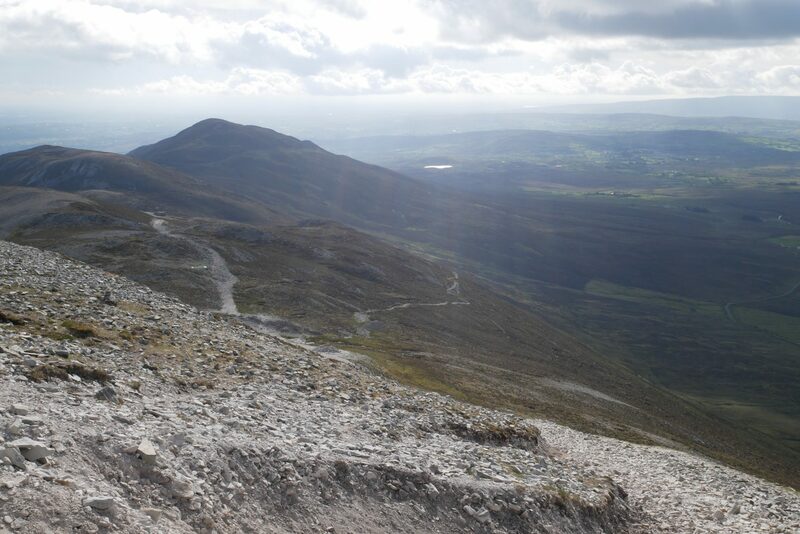 The advantage is that I am alone and I can therefore enjoy Croagh Patrick in peace. 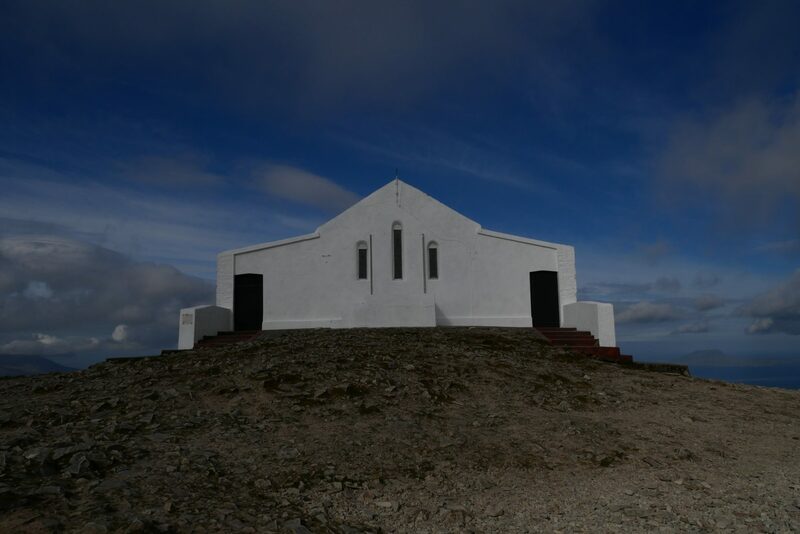 At the top there are some cairns but above all a chapel built in 1905. The view that the place offers is superb. 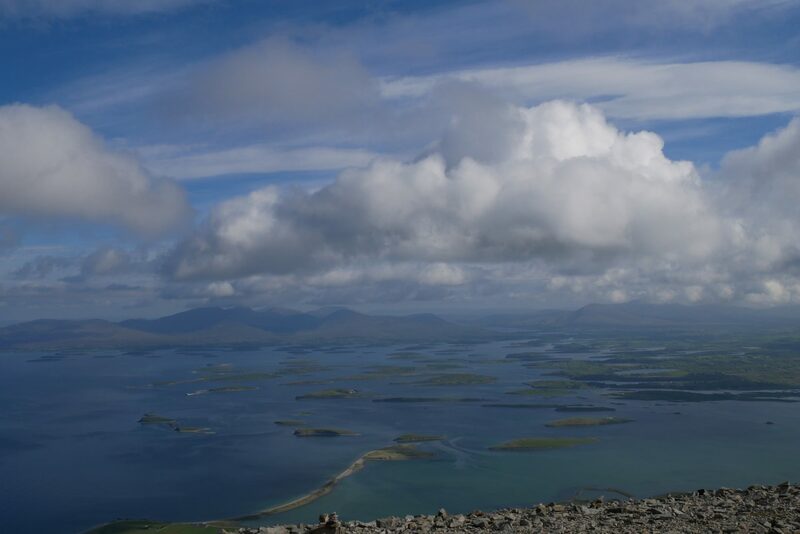 To the north one can admire the coastline and its innumerable islands, to the south, the Connemara in the distance and the Bens. It is very beautiful especially that the weather is sunny once more (what a chance at this level). I enjoy a good moment of my summit loneliness before resuming the descent. I crossed the people I doubled on the climb, they are very tired, especially since they have no water, I give them some. There is no water along the way (or at least I have not seen), so plan well enough to eat and drink but also always go with a raincoat, you never know in Ireland. For the downhill, I take the quick option: mid-run slipping controlled (more or less) on the rockery, it’s much faster and it does less harm to the knees. I crossed a lot of people who start climbing of which many people not equipped enough (no water for example) … I join the parking at 10:30 am that is 2:30 for the round trip with the break at Summit … Not bad !! I am happy it was a very nice climb. 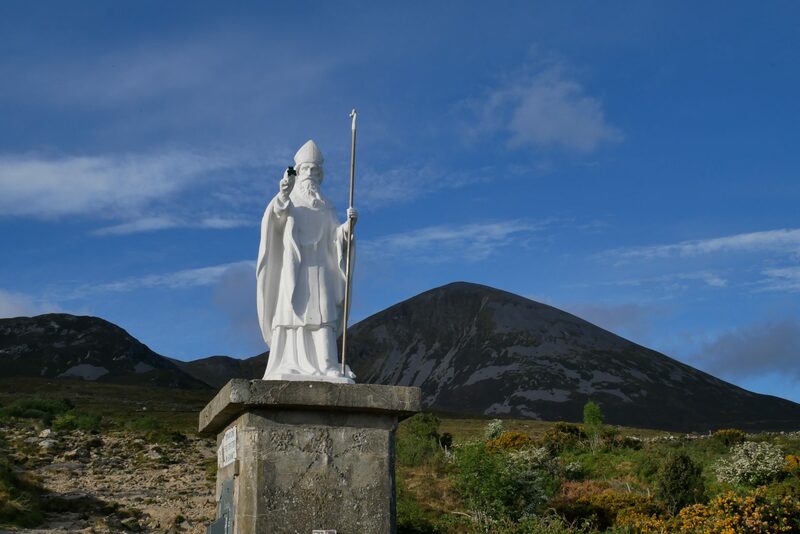 I take the time to rest a little and then take the road on the Wild Atlantic Way, direction Achill Island. As always the coastal road after Westport offers beautiful views. 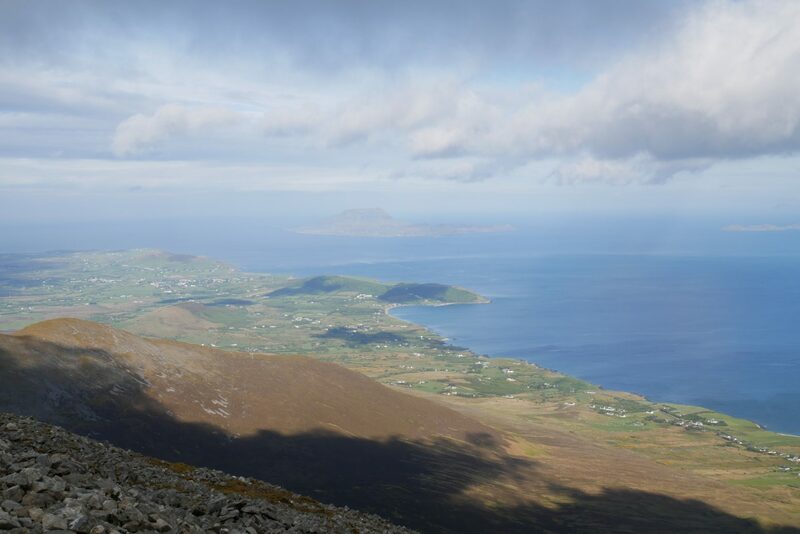 So I quickly get to Achill. Although it is an island, it is connected to the land which is convenient. 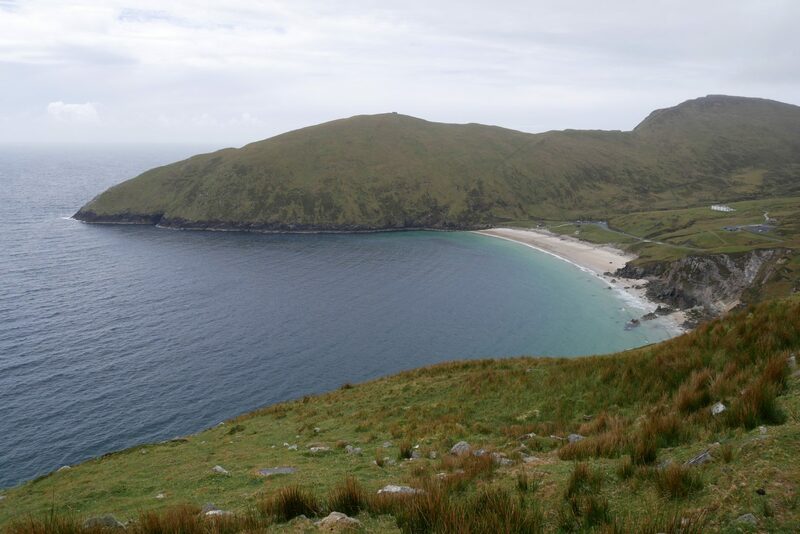 Achill is the largest island in Ireland. 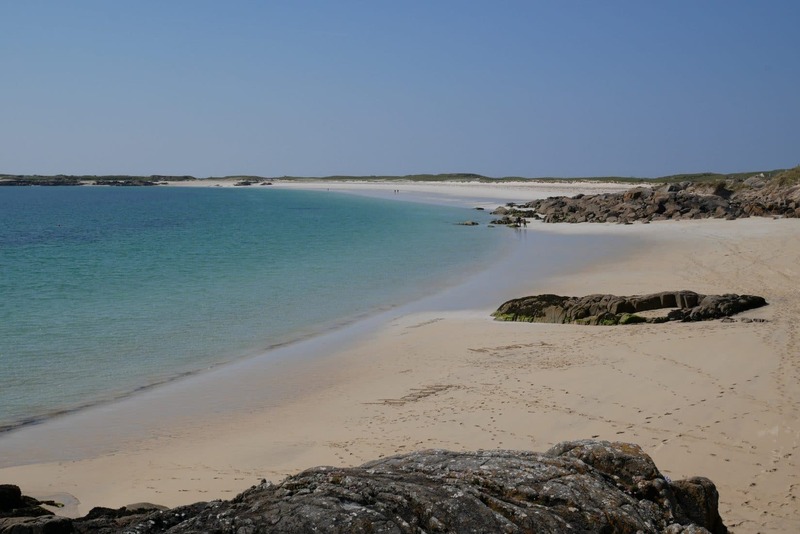 It has a particularly rugged coastline, but all this offers beautiful scenery. 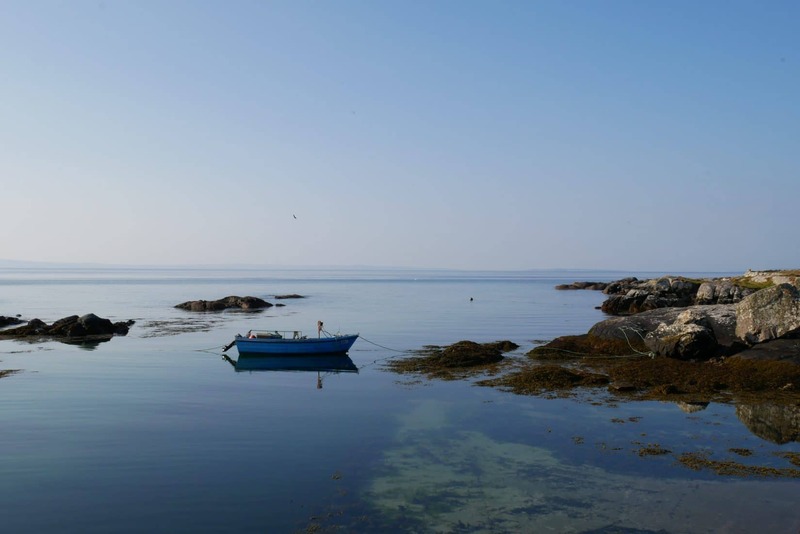 I did not spend much time on the island but the atmosphere looks calm and serene in the small fishing villages. Unfortunately I have (finally) been caught by the Irish weather and it rains a lot which obstructs the view a little and limits the use of the camera. On the other hand this bad weather gives a really nice mood to the coast. 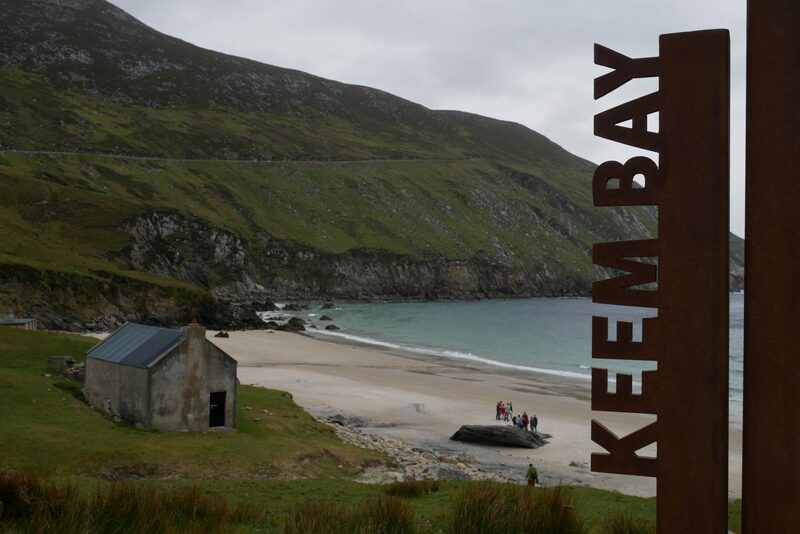 The Wild Atlantic Way leads to Keem Bay, the western point of the island. It is a small beach nestled between high cliffs. The road to reach it is not wide and it is difficult to overtake … Stop a little before the final descent if you want a picture of the beach as a whole. The place is really nice even though there are a few people. 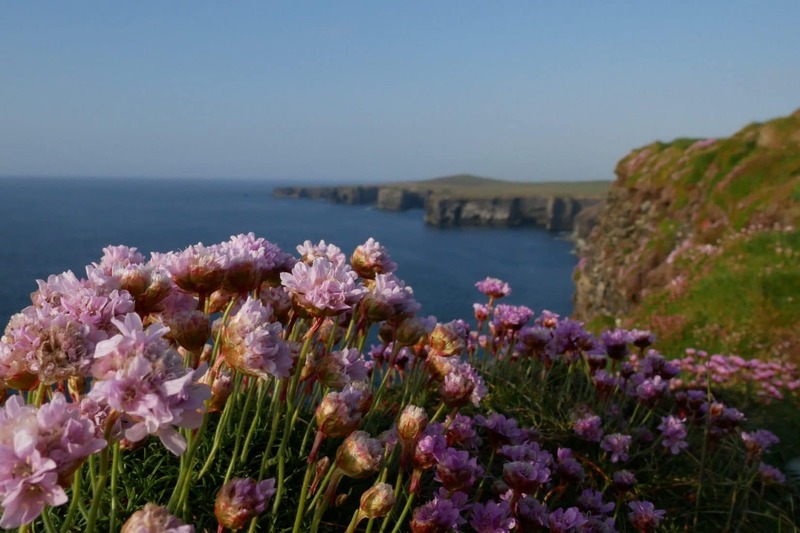 There is a lovely stroll up the cliffs to the north. These offer nice views and a very marine atmosphere. Luckily again I realize this walk under a cloudy sky but not rainy! 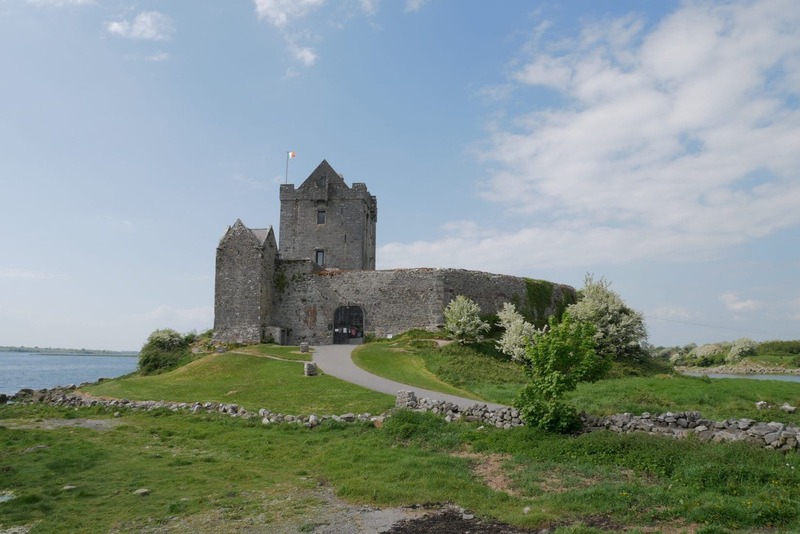 Once this pleasant stopover, I resume the road on the Wild Atlantic Way, it is also well done because we do not take the same route at the entrance and exit of the island. After a “shopping” break, I continue north towards Ballycroy. 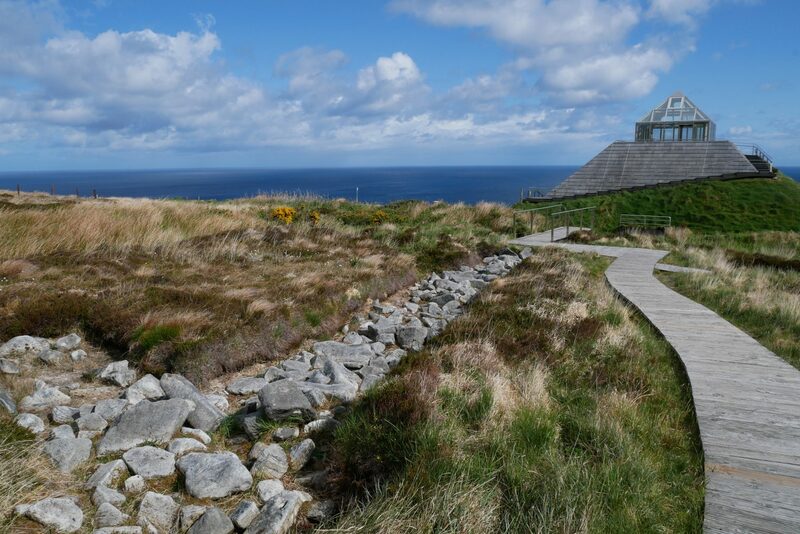 I will make a quick stop at the Visitor Center of Ballycroy National Park for a coffee. 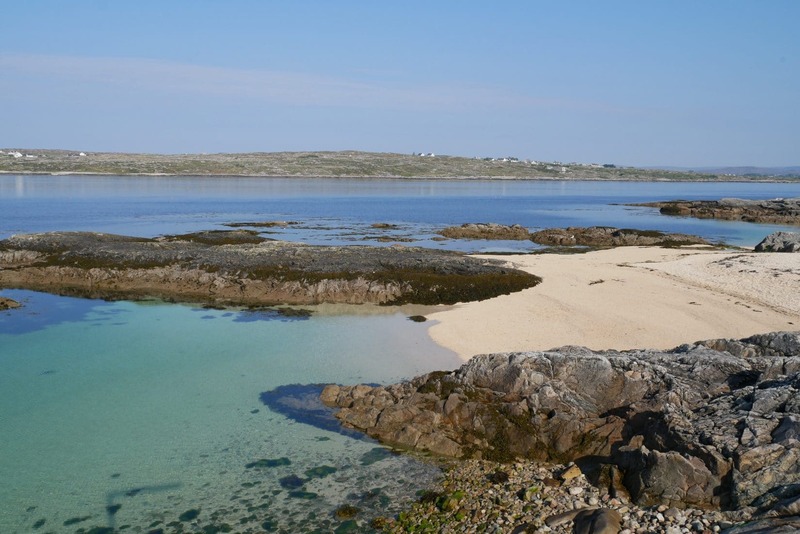 The Wild Atlantic Way then takes us to the Mullet Peninsula where I plan to spend the night. This peninsula, very thin, is almost 30km long in total. Without dwelling on the details I was quite disappointed by the southern part because there are some nice views but not amazing … In all cases, the houses are scattered over the whole peninsula so there is little place of tranquility. Nice thing to do: there is a whole series of sculptures at various points of the peninsula. 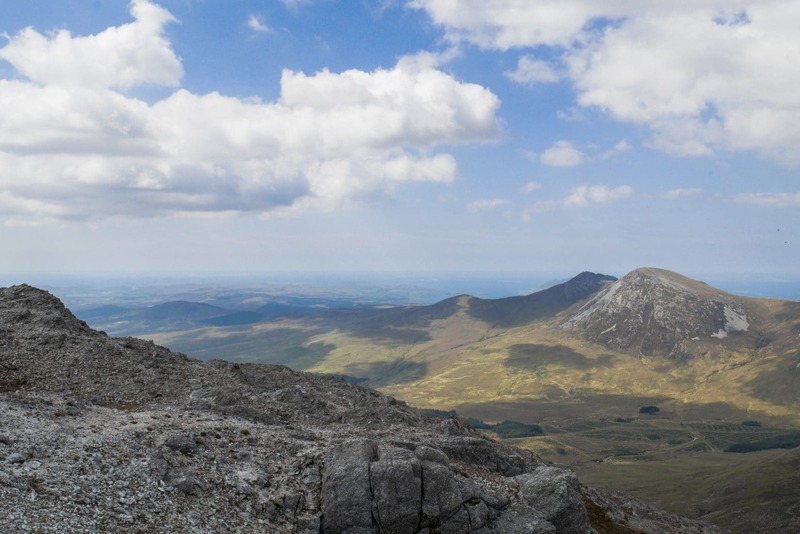 It is beside one of her that I spend the night on Annagh Head. Since there is a strong wind and it may also rain tonight I prefer not to settle the tent because it will not have time to dry by my departure. I will do the night in the car but generally I sleep well (in any case it was the case in Iceland). The night was good and it rained so I’m glad I did not have to bend the tent soaked. I take the road early but not directly the Wild Atlantic Way. 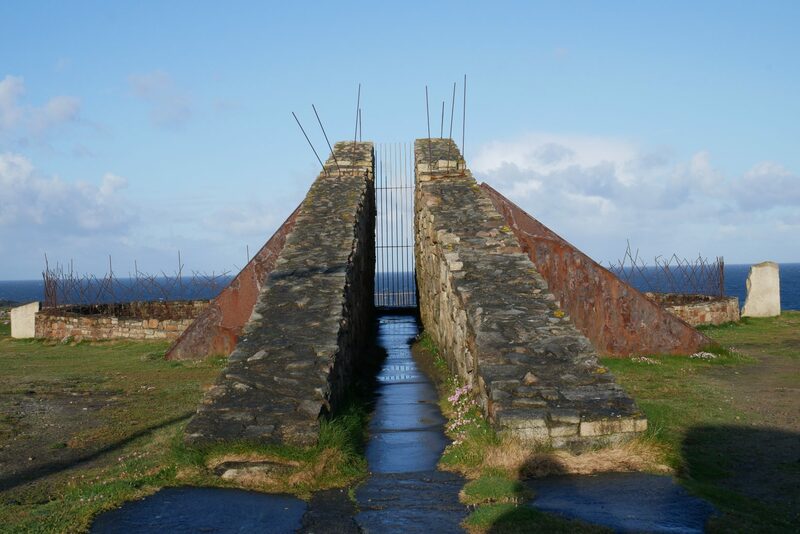 I headed towards Dun Na Mbo a sculpture that looks out on the sea a little to the north. The place is nice but the sculpture not extraordinary by cons a little further offshore there is a lighthouse on Eagle Island which really offers a great view especially with a sea a bit rough. I then drive on the northern part of the peninsula, the roads are pretty and wild. 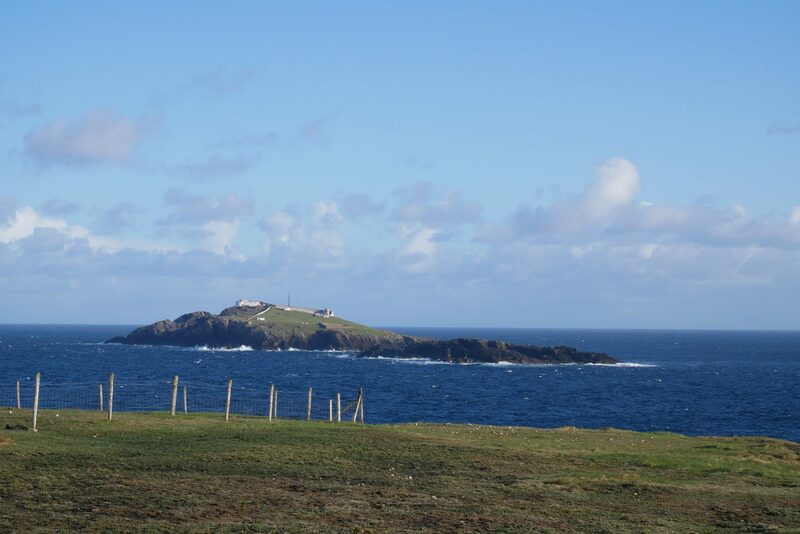 I then take the course of the Wild Atlantic Way on the R314. The roads are really nice and narrow on this part. 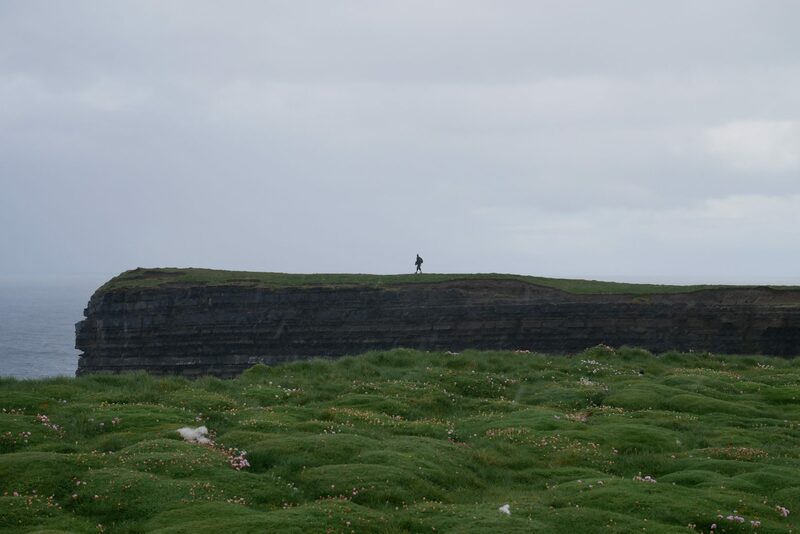 I quickly arrive at Ceide Fields. 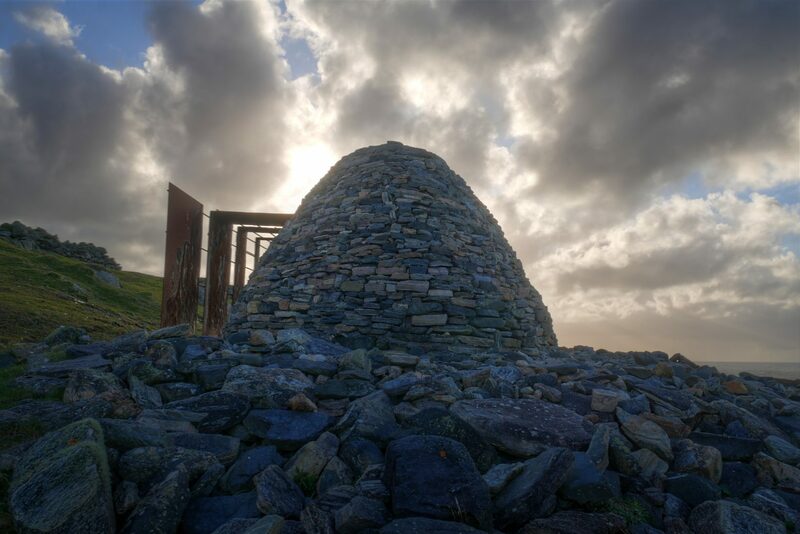 Ceide Fields is a major archaeological site in Ireland. Many testimonies of the settlement dating from the Neolithic were found there, so I wanted to visit. The “museum” opens when I arrive around 10am. So I go around the exhibition, it’s interesting but not great. There is then a film that is not very interesting and old. I hope it will be better on the outside but I am also disappointed. The vestiges highlighted are rather poor. 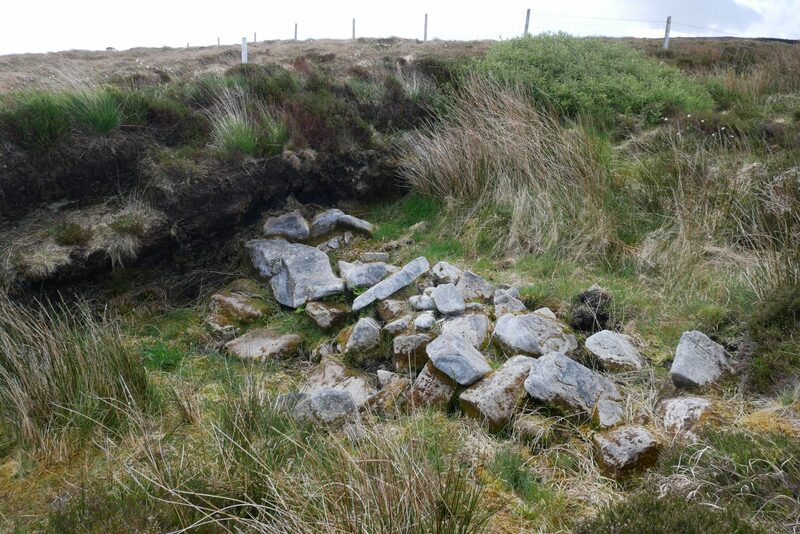 This remains a beautiful testimony of the past but in this case we have only a few walls half out of the peat. I think that for a “major” site like this it would have been interesting to have a reconstruction of houses or more vestiges. The visit is still worth even if I leave it disappointed. On the other hand I advise you to admire the cliffs in front of the visitor center which are quite stunning. 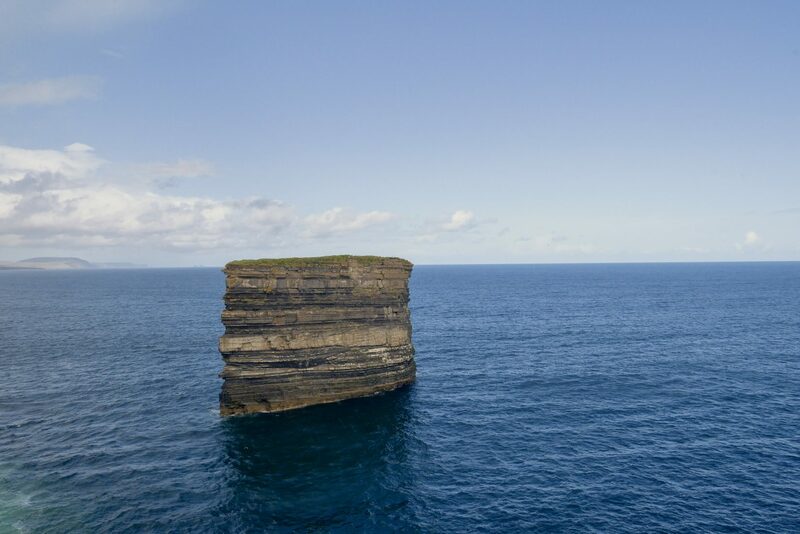 Back on the Wild Atlantic Way, I head for Downpatrick Head. The road is nice but there are small storms passing so it will be necessary that I sneak between two showers to go to see the place. The photo shoot ends quickly because a very violent storm arrives. So I go back to the car to avoid soaking myself and the camera. I take the road on the Wild Atlantic Way towards Sligo. 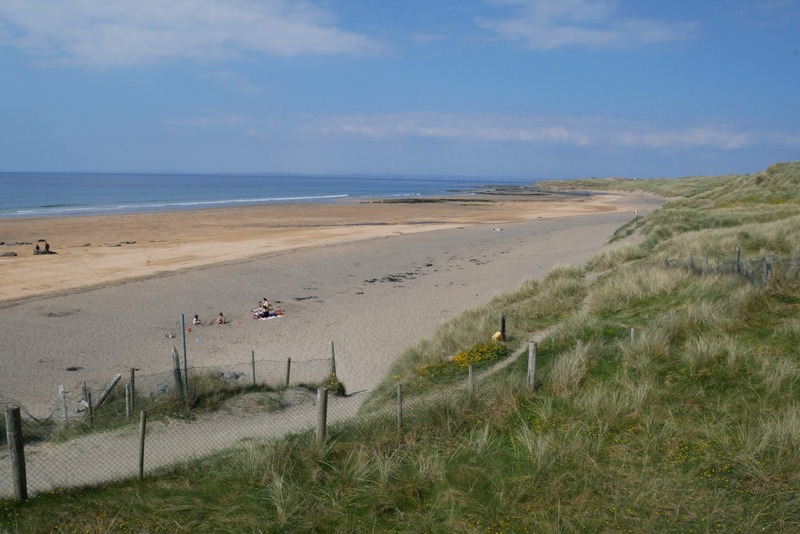 The road runs along the coast to the nearest and offers beautiful views of the coastline including this lovely beach towards Ballina. I drive quietly towards Sligo taking my time. This portion does not offer “major attractions” but you come across nice places. It is a pleasant moment. I like this place. 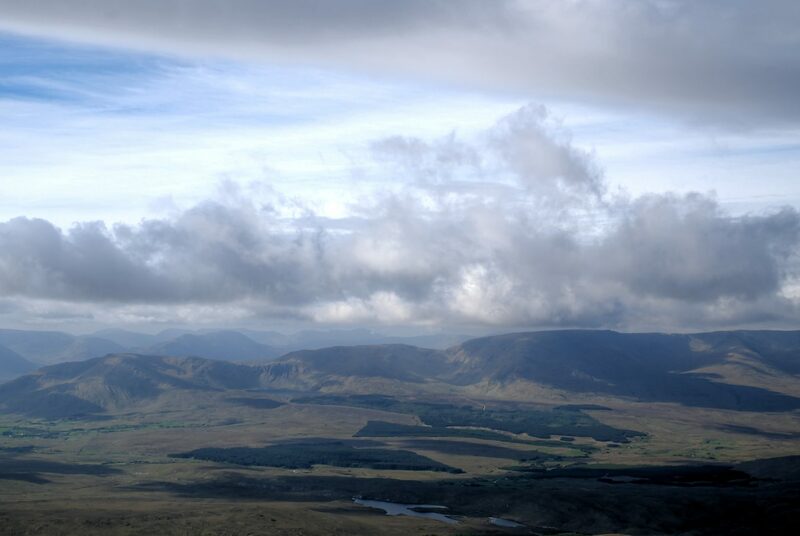 Direction Sligo! There is a bit of traffic as quite a few people come into town after their afternoon beach. Sligo does not make a good impression … I arrive at the youth hostel near the station in which I want to stay tonight but the place is dull and does not invite to stay here. So I’m going to take a tour in “city center” and I’m not really excited about it, it’s all sad and grey. My decision is made: half turn and direction Strandhill. I stop at the youth hostel I saw earlier on the main street. The “Surf N Stay” Hostel is a hostel that also offers lodges and that is in a very cool surf spirit. There are not many people and I will find myself alone in my dormitory! I’ll end the evening at the pub across the street, the Strandbar. 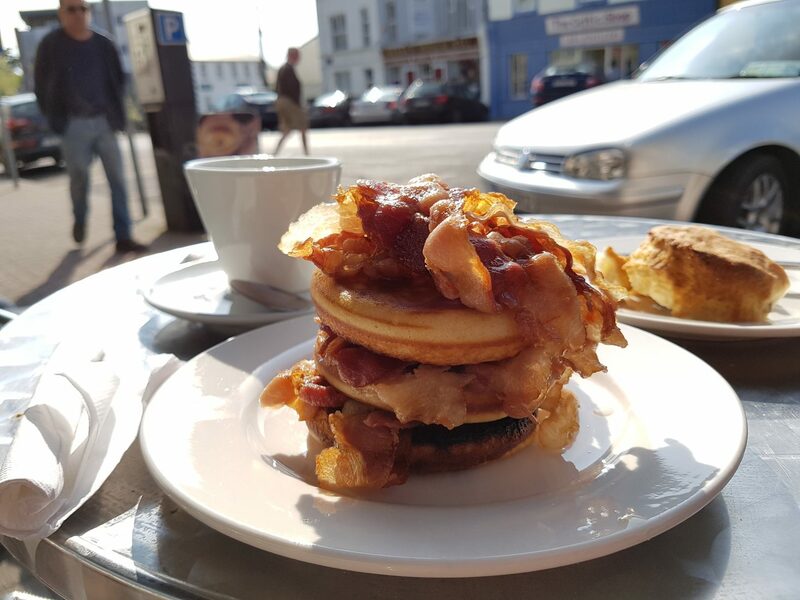 I did well to make this decision in any case, the city is more friendly than Sligo. 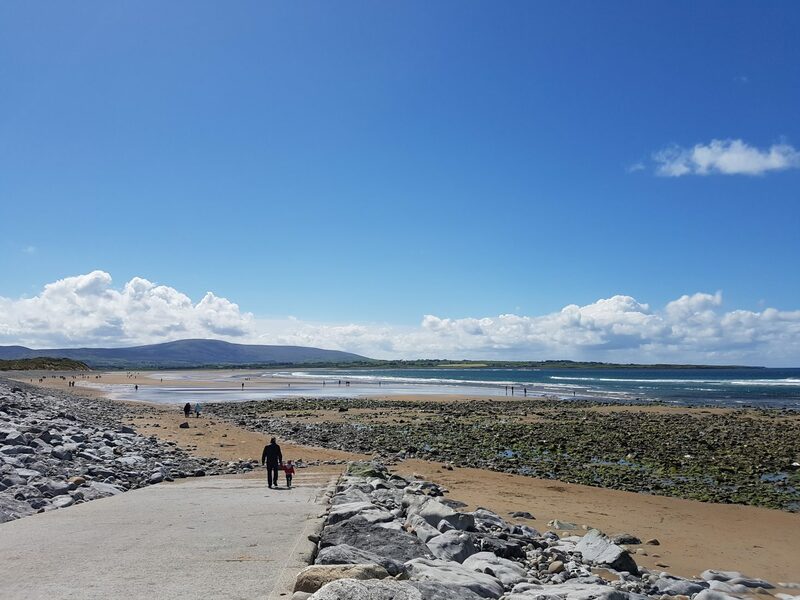 It is in Sligo / Strandhill that ends my road trip along the Wild Atlantic Way. On this seventh day, I drive Dublin where I will spend the afternoon and the morning of the next day before flying back home. 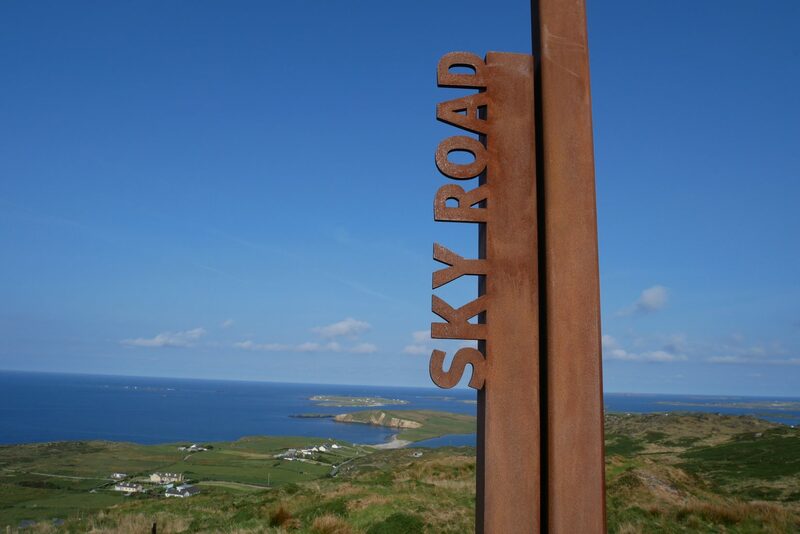 What a great idea to have created this road, the Wild Atlantic Way. You can be carried along its 2500km by following the signs, which is very well made, and one discovers more sumptuous sites, typical and dynamic cities and many historical places, not forgetting, of course, the pub and their awesome evenings! 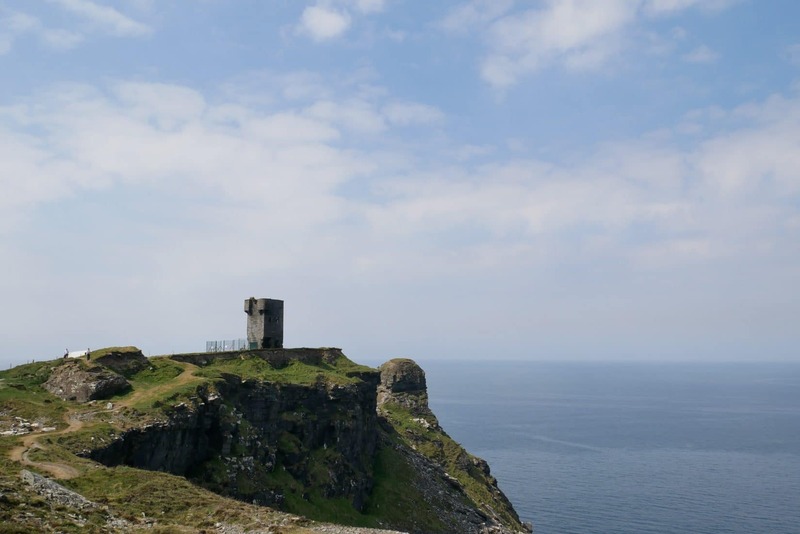 In summary, I really enjoyed these six days on the wild Irish coast. 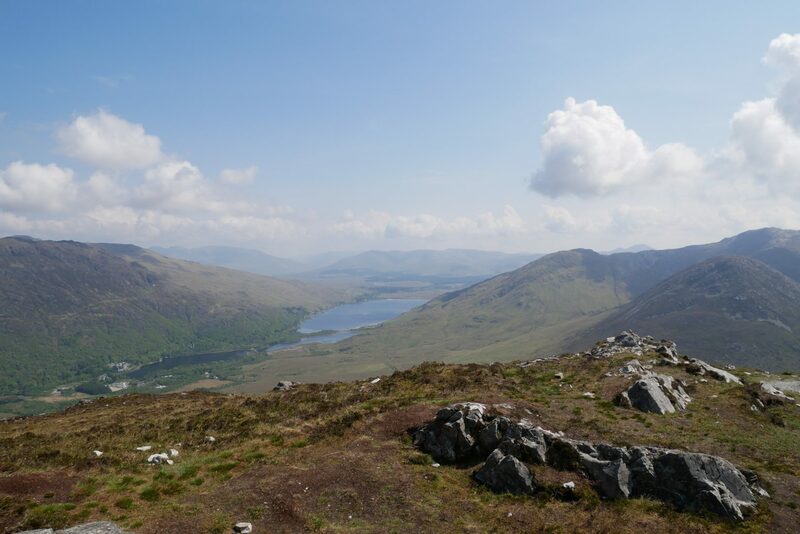 I did not know this country but I discovered a part of it with pleasure and especially the Connemara which is magnificent. In the end, I traveled 1700km on half of the Wild Atlantic Way at an average speed of 65km / h: the roads are really narrow! 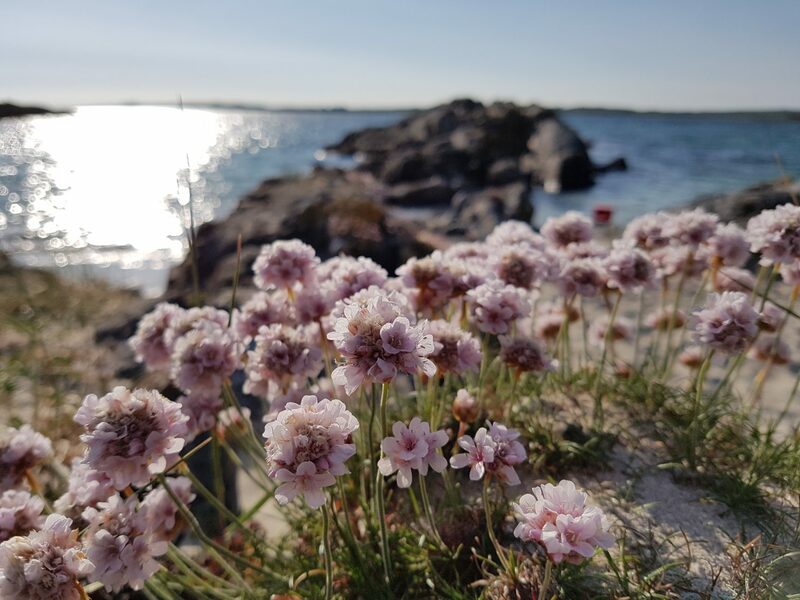 I still have a good part of the Wild Atlantic Way to discover and I will gladly eat the miles and explore the south of the island in particular. In any case if you are tempted by this road go and discover all its wonders!